I walked by the Nexus condominium tower today, to check on its progress from November. 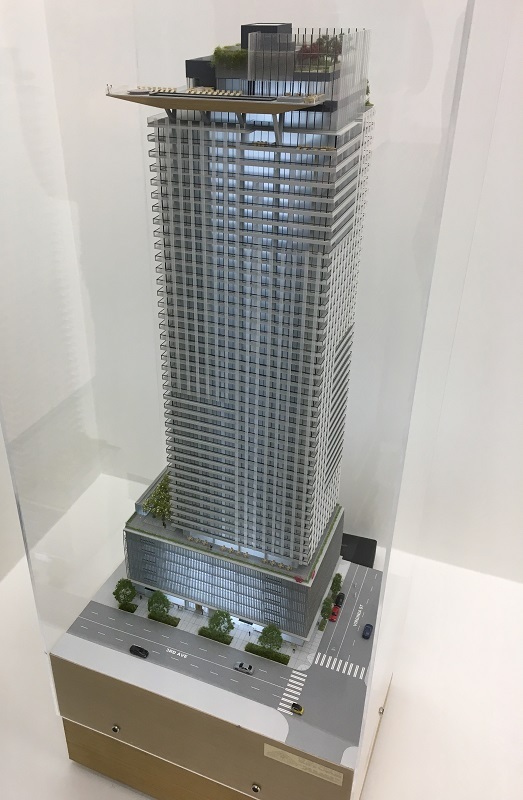 The tower’s construction is about to be officially topped off, with occupancy expected by late 2019. Some 28 (of the 389) units are still available. 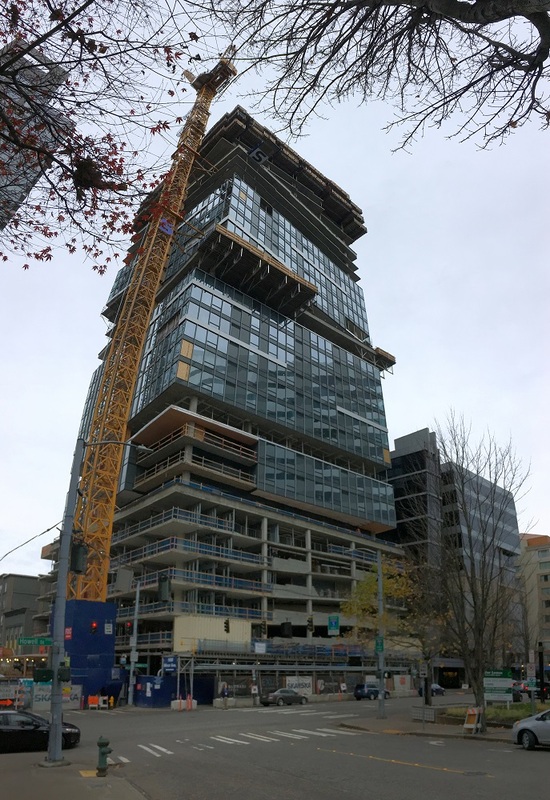 The Nexus condominium tower at 1200 Howell St now has its four stacked ‘cubes’ with their 8° offsets in place. The building has 41 storeys. The view from the north side. 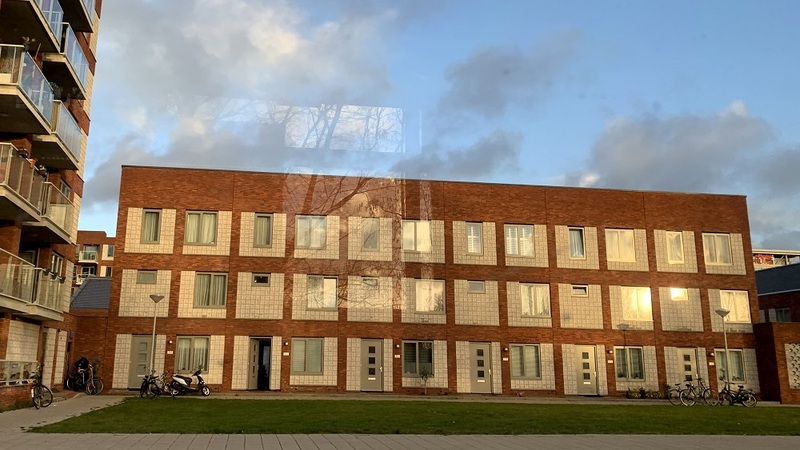 The building’s appearance seems more mundane than the gleaming depictions of it on the Nexus website! 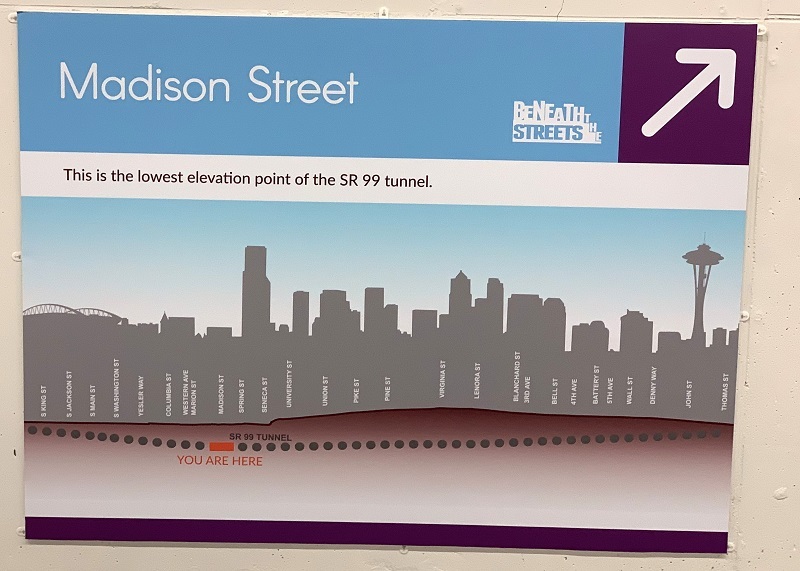 .. but maybe I should reserve judgement until its construction has been completed. 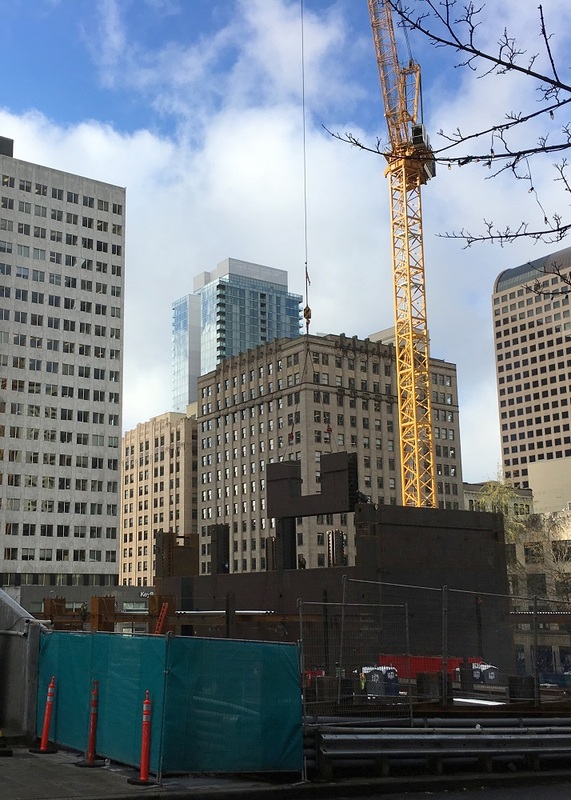 Here is what the Rainier Square Tower in downtown Seattle looks like now. (See this post from November). 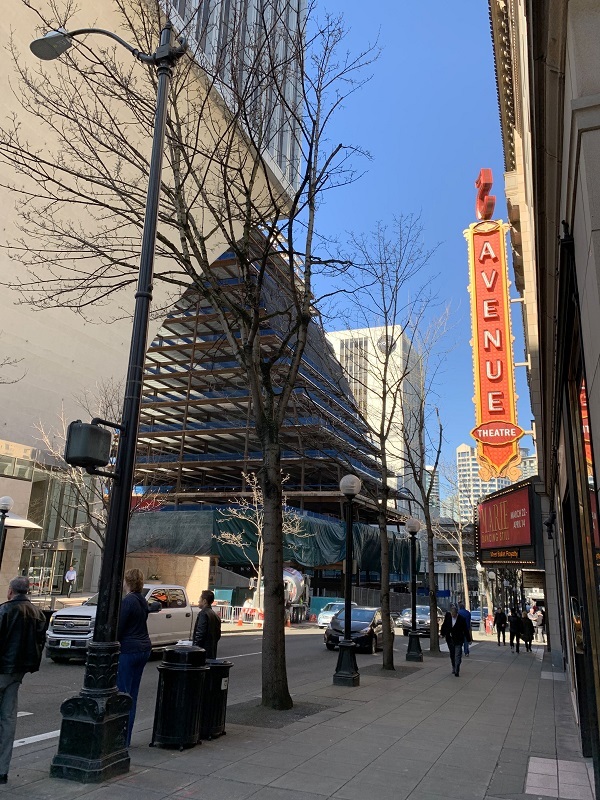 Amazon was to lease all 722,000 square feet (30 floors) in the new building, but announced last week that it would not do so anymore. It will look to sub-lease the space to other companies instead. 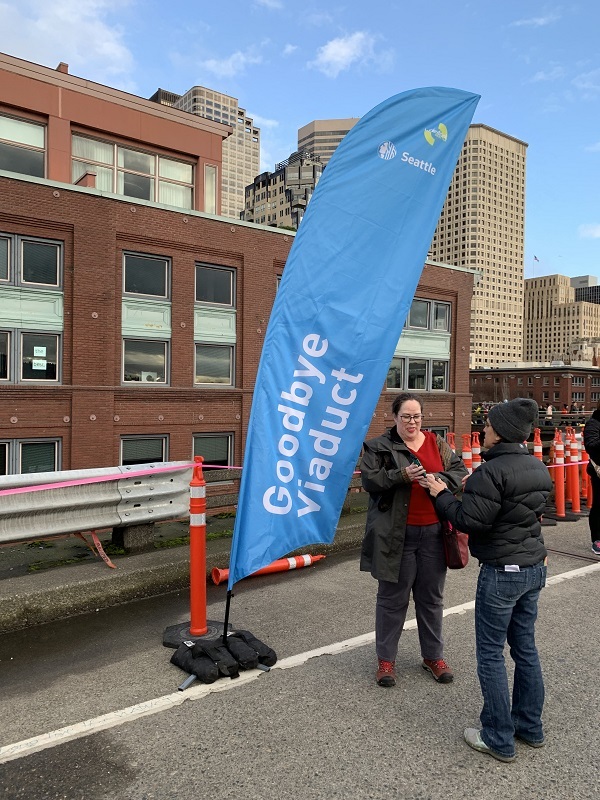 This announcement came 10 months after Amazon had threatened to pull out of the building if the city were to impose a new business tax (which the city then backed away from). Looking north, from Fifth Avenue. 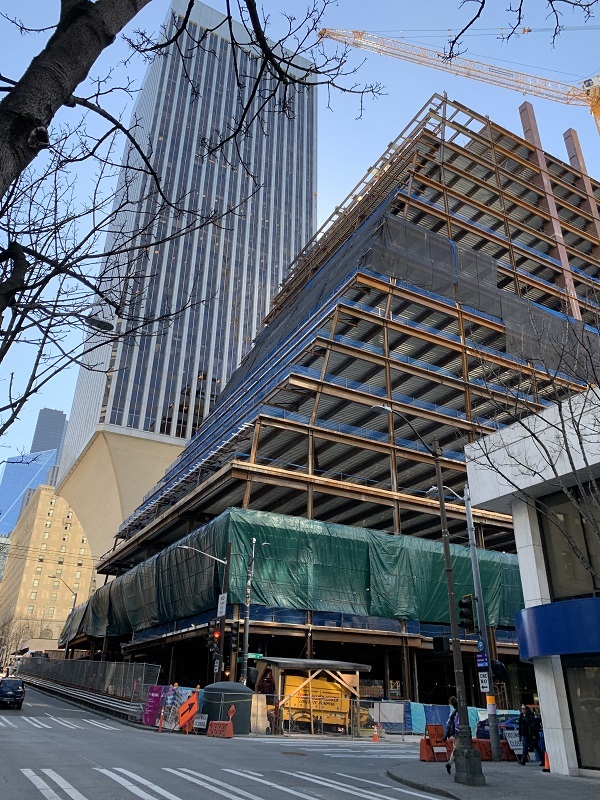 The shape of the base floors of the new Rainier Square Tower, shows behind the white pedestal of the 1977 Rainier Tower. Here’s the view from Fifth Ave, looking south. 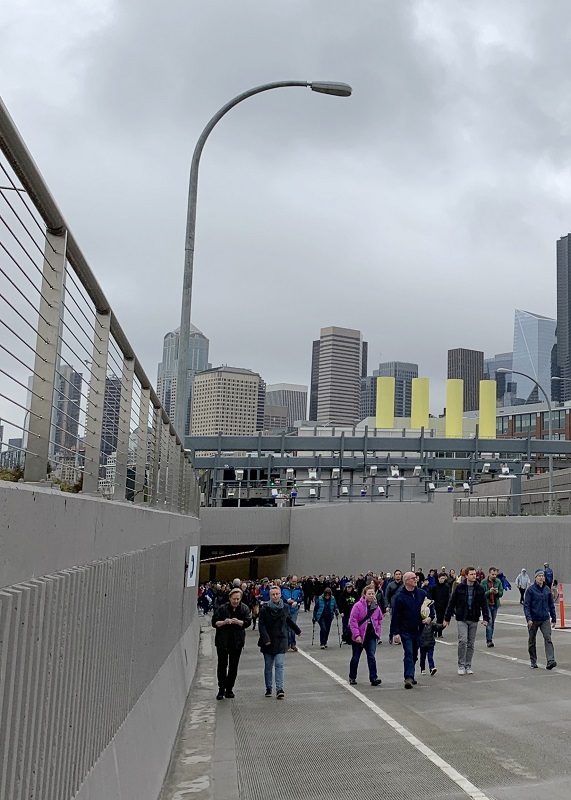 The Rainier Tower (41 floors) and the new Rainier Square Tower (58 floors) are right next to each other. The profile of the tall new tower will keep it from obscuring the older tower. 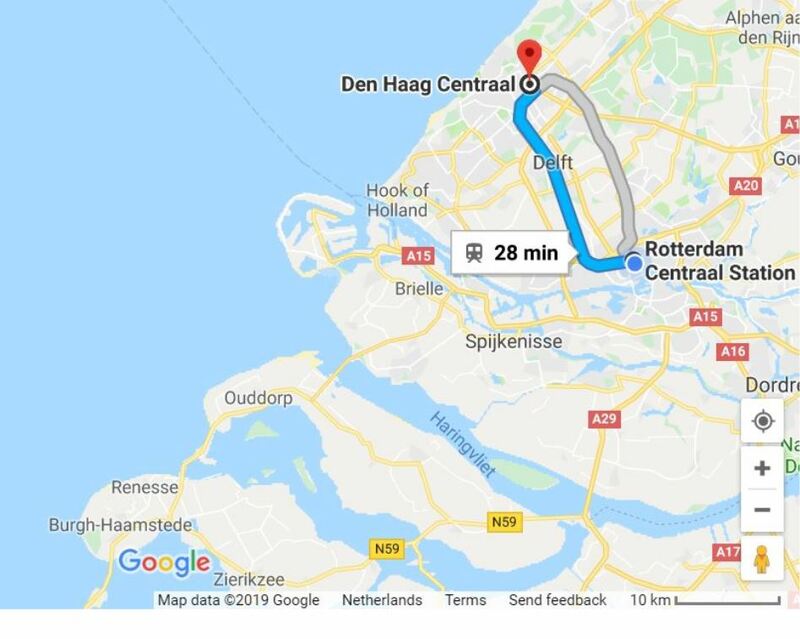 I took the short train ride out to Delft and The Hague today. The sun and the balmy weather of Wednesday were gone, and it was foggy and cold until early afternoon. 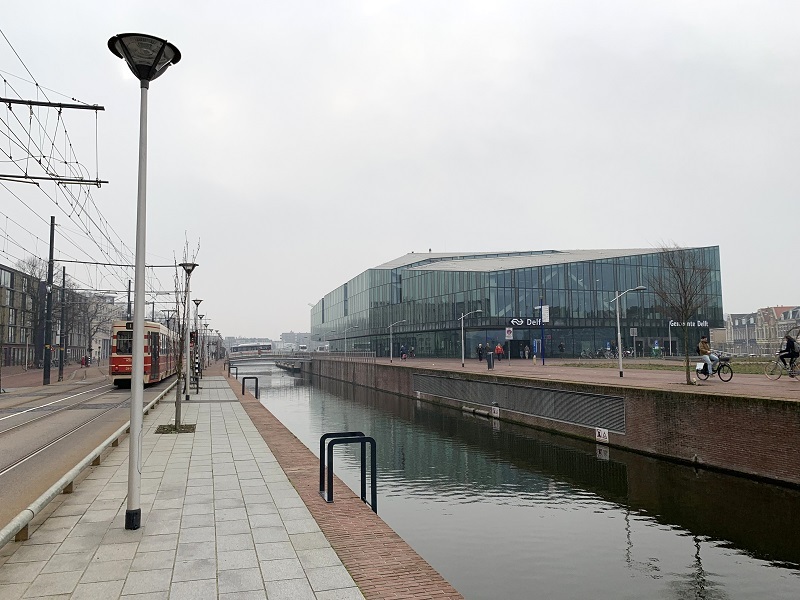 Here is Delft train station building as I look back at it, with its 2015 remodeling. 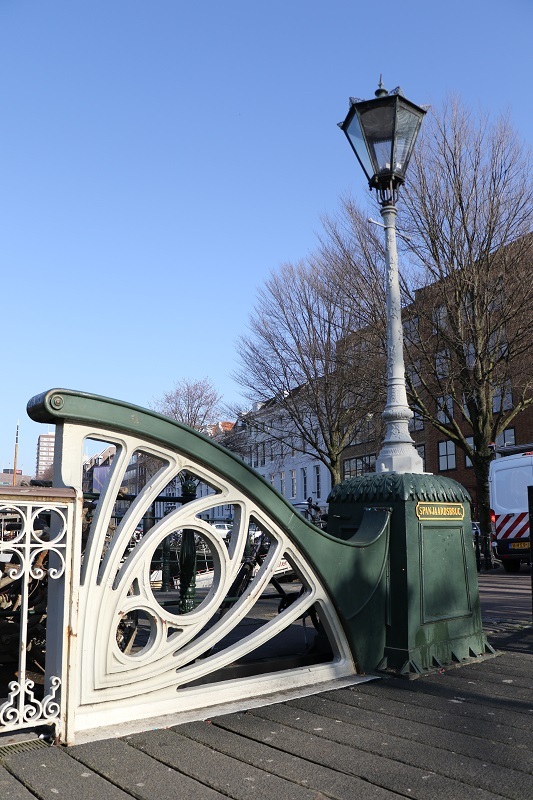 I am walking towards the Markt, the main square in Delft. 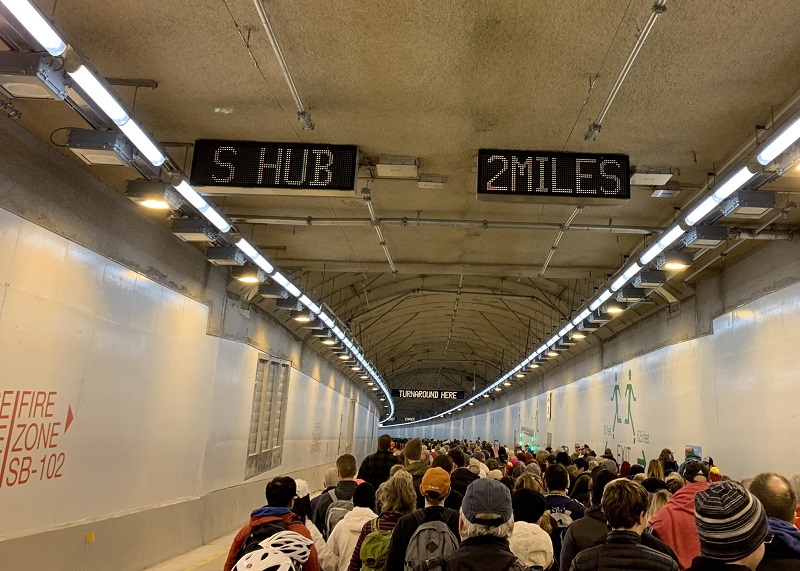 (Note: That’s a streetcar on the left of the picture, not a train). 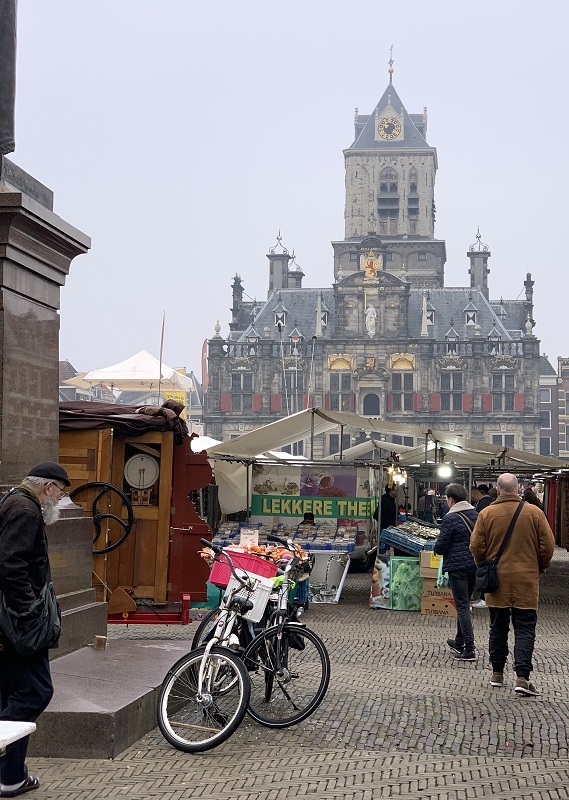 It was foggy and barely 10 am by the time I got to the Markt square, and the stall owners that sold food and souvenirs were still getting everything ready. ‘Lekkere Thee’ (tasty tea), says the banner in the middle. That’s the Delft Town Hall in the distance. 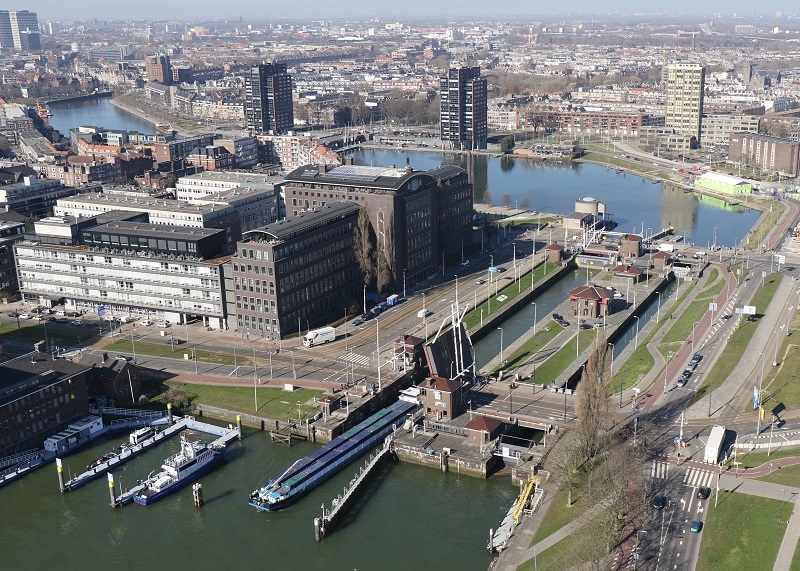 The Nieuwe Kerk (New Church) towers over the Markt town square at 108 m (356 ft). It is not new, of course! 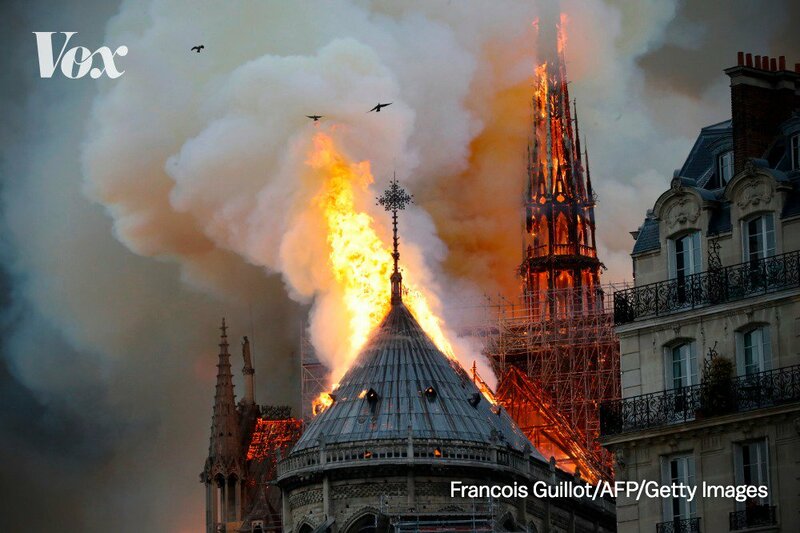 Its construction in the Gothic style was completed in 1496. 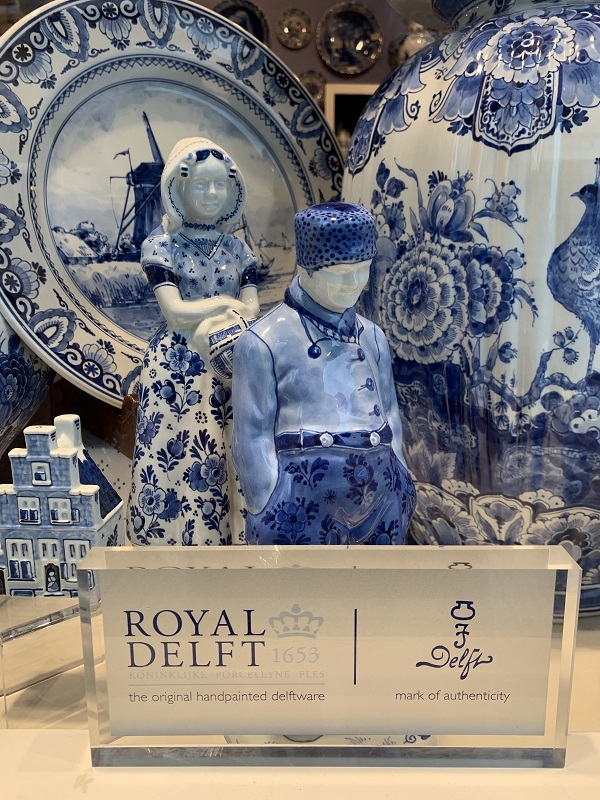 I took a look at the famous blue Royal Delft porcelain ware, but did not buy anything new. (I already have some). These hand painted pieces are much more expensive than the mass-produced ones. 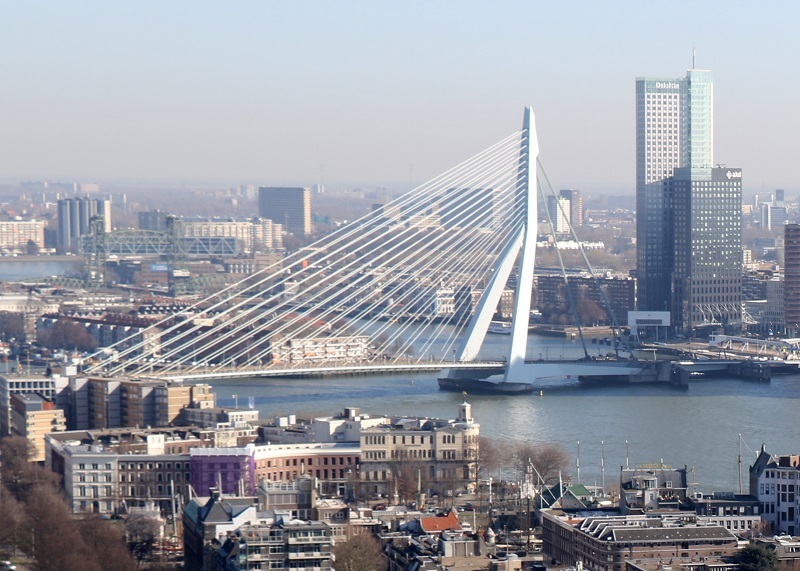 Now on to The Hague. I was determined to get a glimpse of the North Sea, and found it at the beach and promenade at Scheveningen. 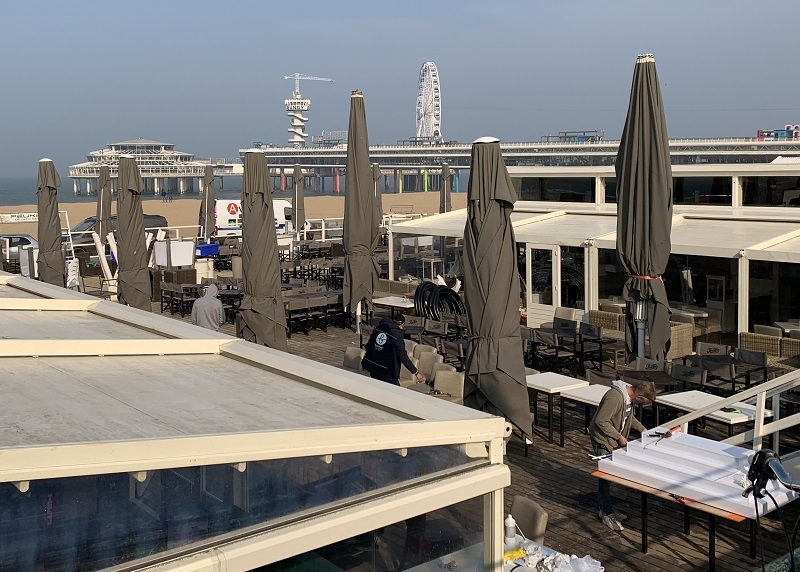 There is also a pier with a Ferris wheel, and all the businesses are getting ready for the summer season’s visitors. 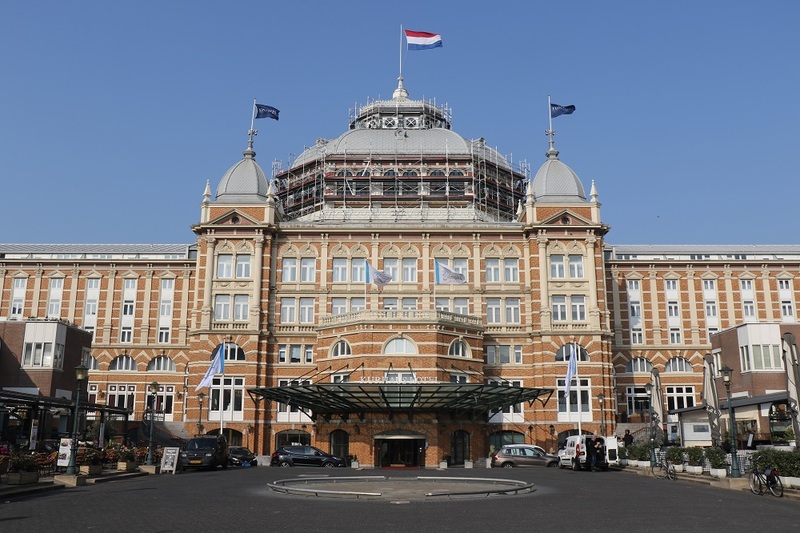 Nearby is the Kurhaus Hotel, with the flag of the Netherlands on its main dome, itself undergoing renovations for the summer. 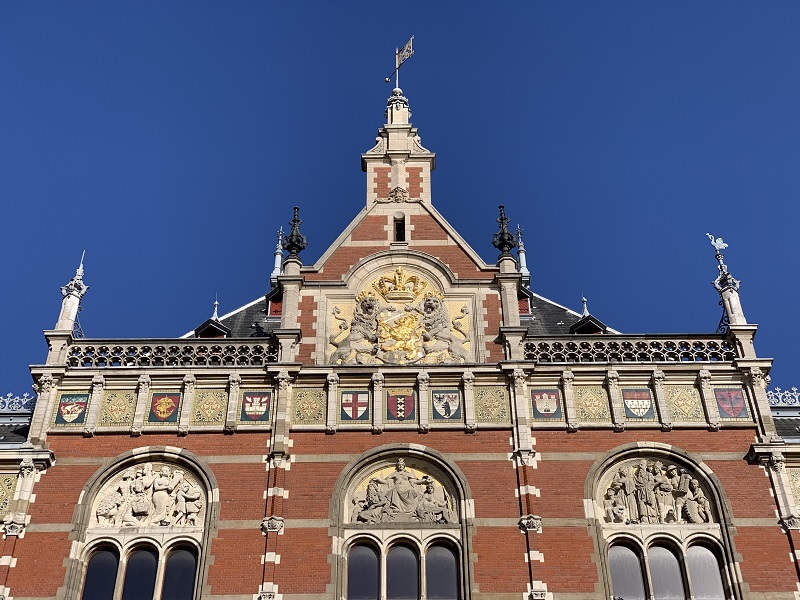 The Vredespaleis (Peace Palace) was marked on my map, and I went out to check it out. Only the little museum was open though, and this is the closest I could get. 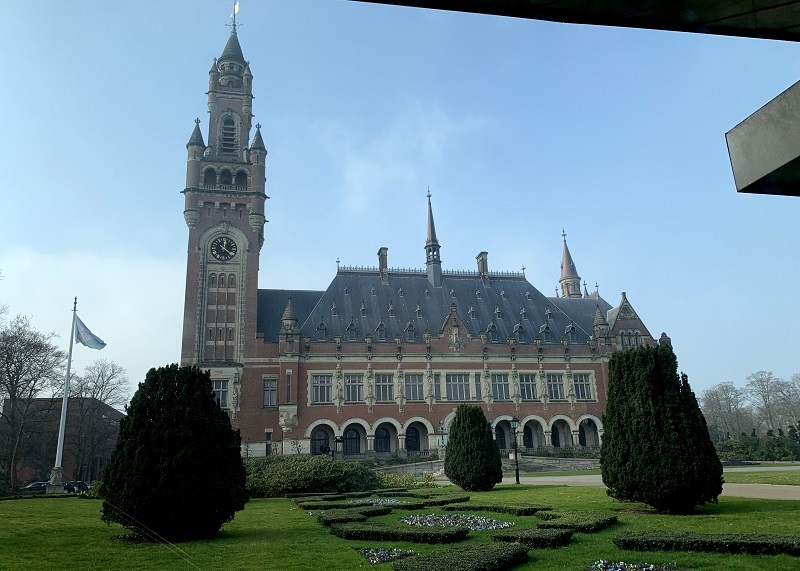 The building (opened 1913) houses the International Court of Justice, the Permanent Court of Arbitration, The Hague Academy of International Law and the Peace Palace Library. 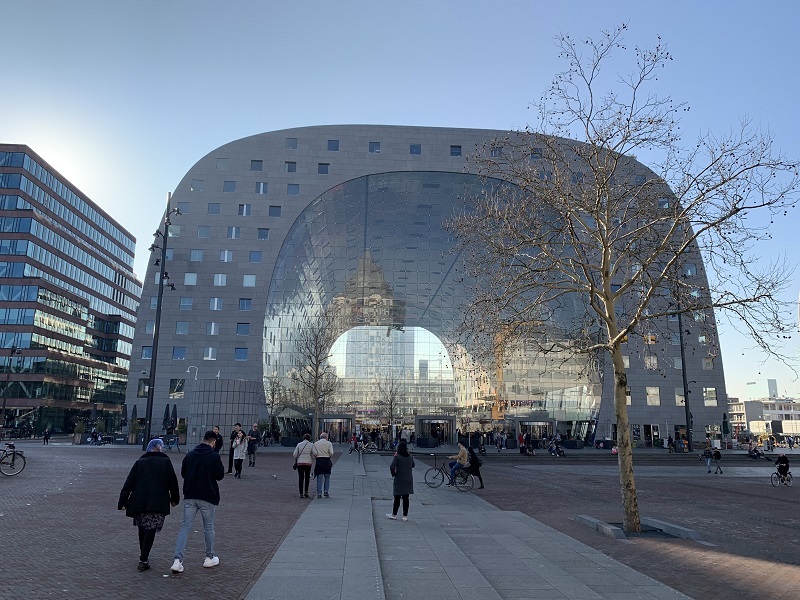 Here’s the entrance to the modern city hall of The Hague. 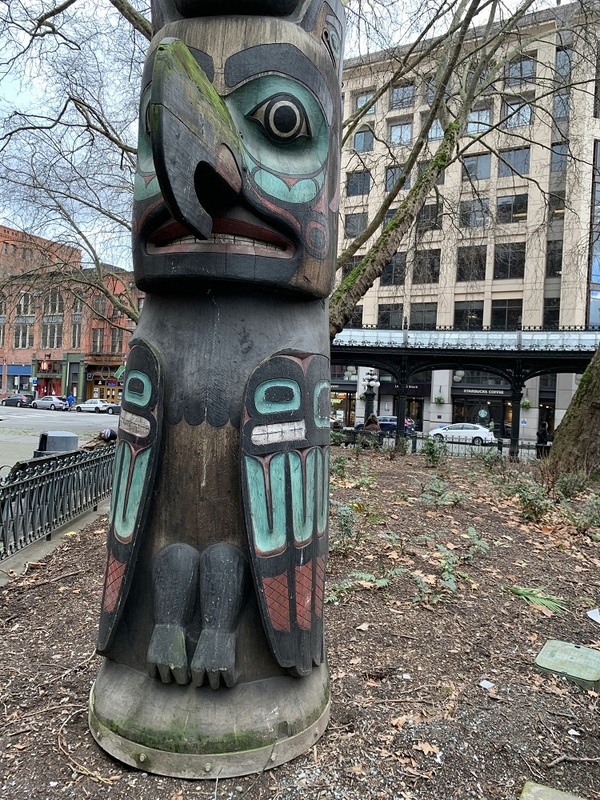 The stork on the city’s coat of arms has a black eel in its beak. 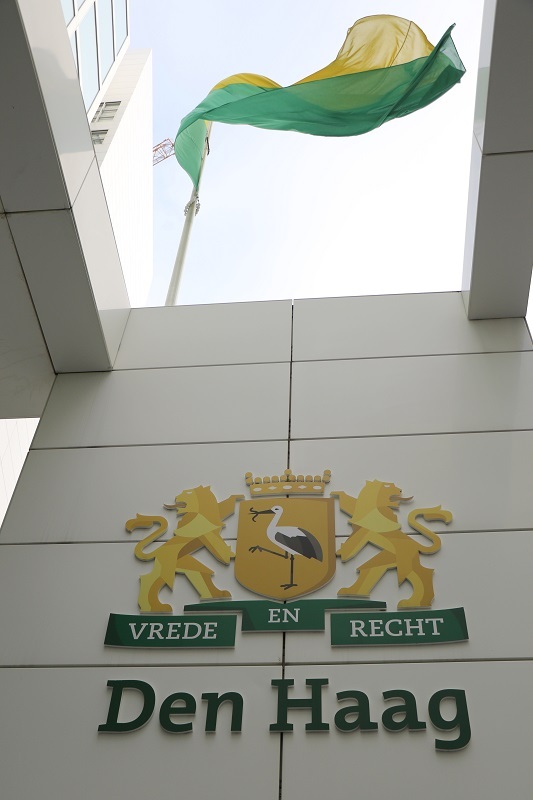 The words ‘Vrede en Recht’ (Peace and Justice) was added in 2012 – a nod to the city’s global recognition as the home of international justice and accountability. 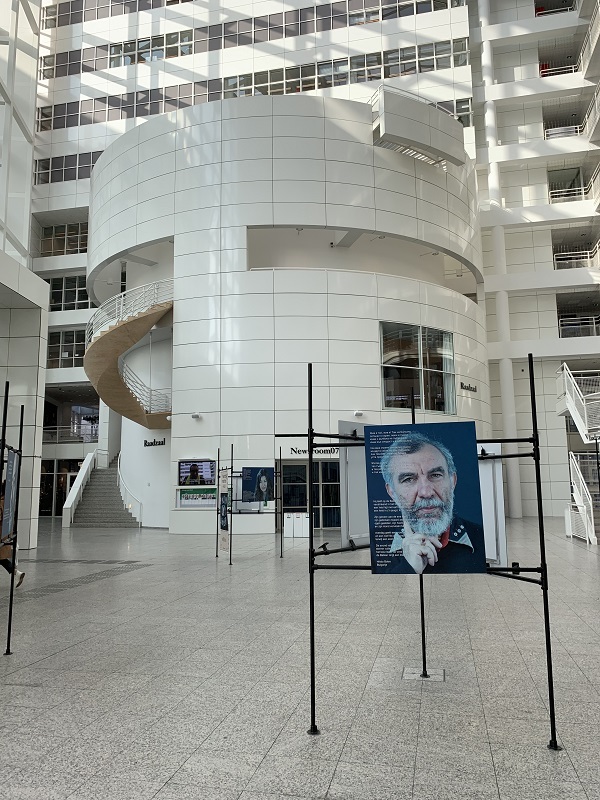 In the foyer of The Hague City Hall building, there are pictures of several human rights activists. 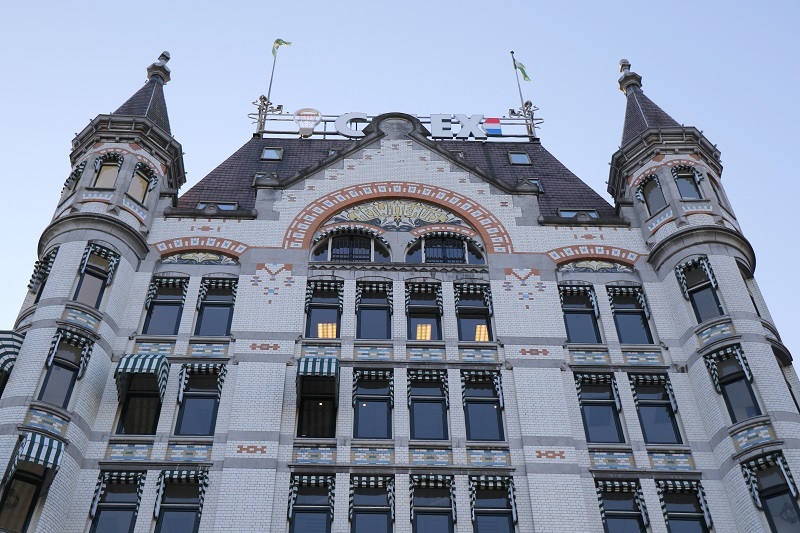 The facade of the Grandcafé Haagsche Bluf in the city center. I love the art deco styling of the building. 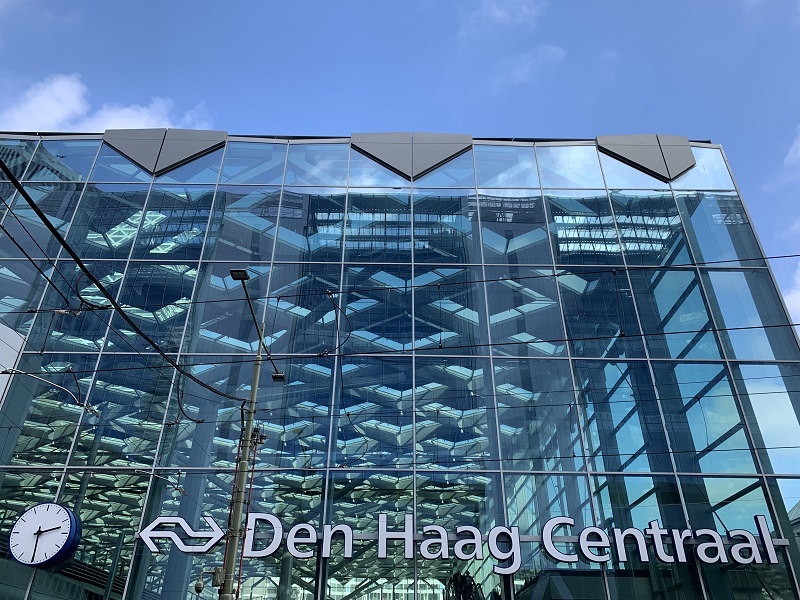 Here’s the main entrance to Den Haag Centraal station, its 2015 renovation showing nice blue glass panels and a diamond pattern in the roof. 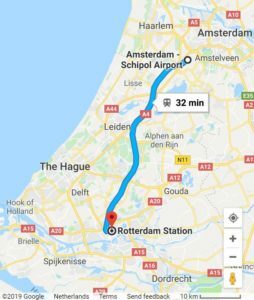 It’s a 32 min ride on the Intercity Direct from Schiphol airport down to Rotterdam Centraal station. The Sprinter is a little bit cheaper but takes quite a bit longer since it stops at 5 or 6 stations on the way. 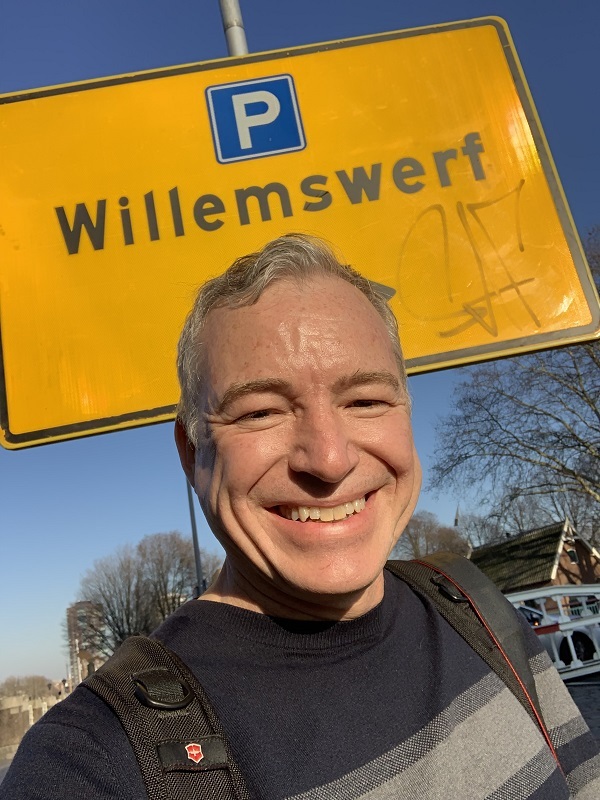 I arrived at Amsterdam’s Schiphol Airport at about 11.15 am this morning. 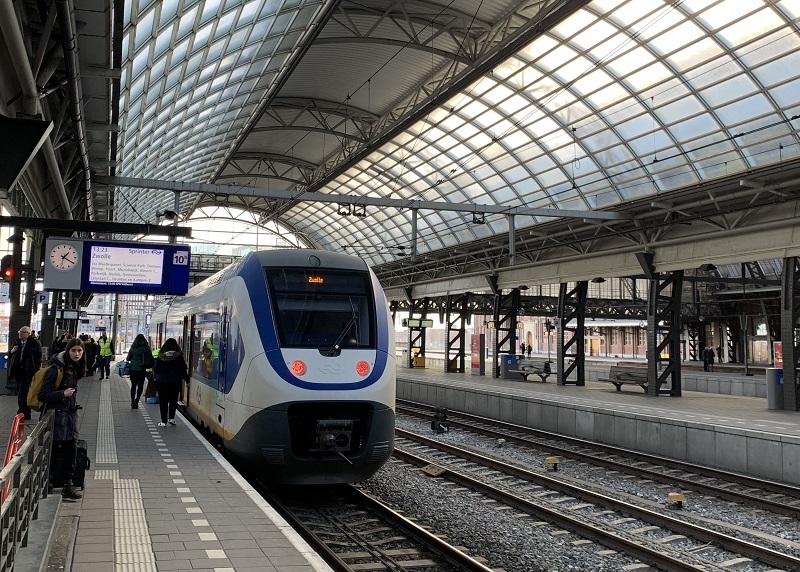 I had to spend a little time at Schiphol to figure out how to use my OV-chipkaart* for the train ride down to Rotterdam, but that’s OK. Now I know how to use it in Rotterdam, as well. *Cannot load money onto it at the ticketing machine with an American credit card! (USA cards do not have PIN numbers). No need to buy a fare ahead of time, but if you travel 1st class, you tap the card once at the station/ platform entrance as usual, and then a second time on the platform next to the train, for the 1st class surcharge. 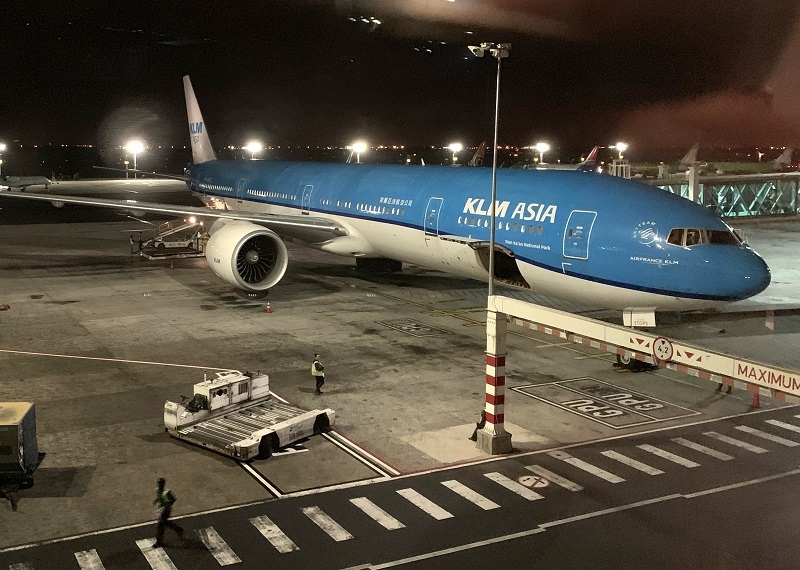 Here is KLM Airlines’ Boeing 777 at the gate at Cape Town International airport. 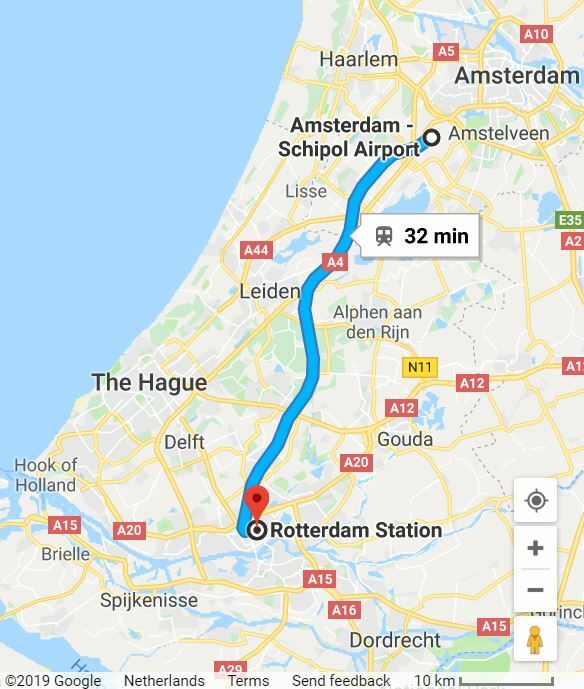 It took 11 hrs 20 mins to reach Schiphol in Amsterdam. 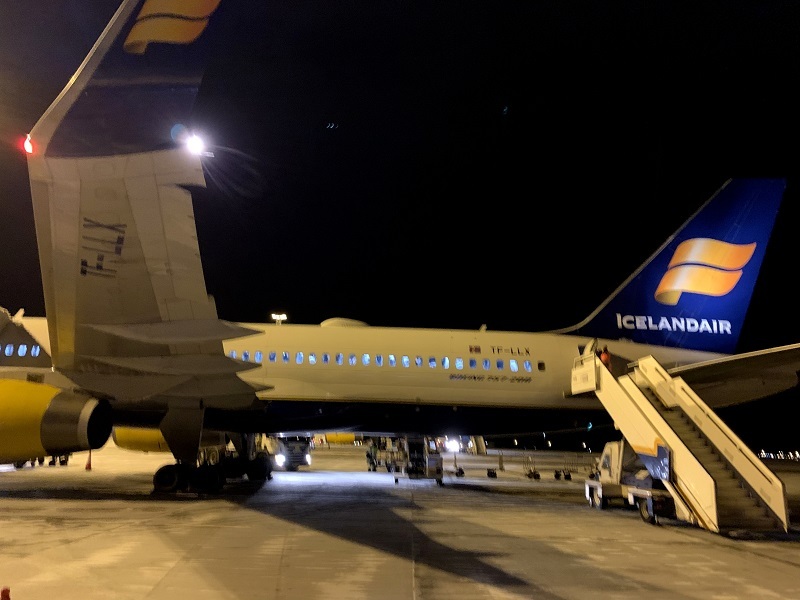 It feels SO GOOD to walk off the plane and stretch one’s legs after all that time. 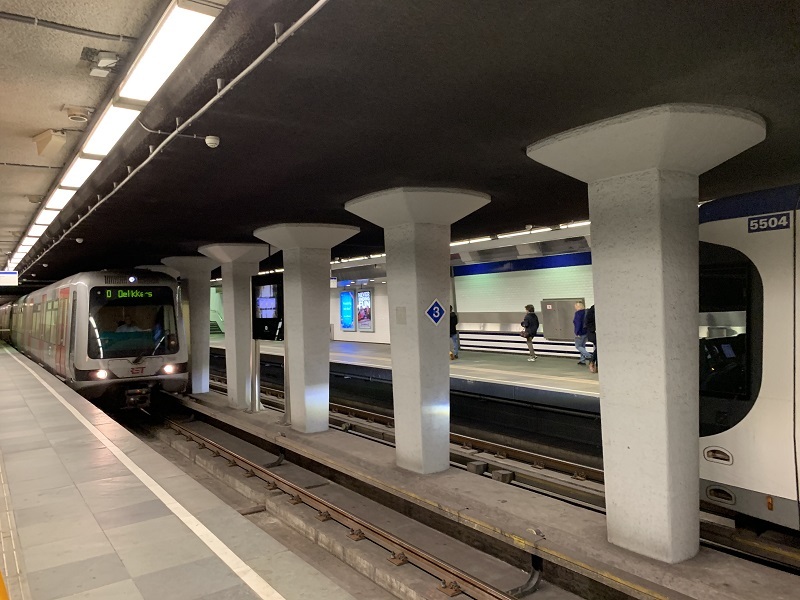 Here are the train tracks at Rotterdam Centraal Station, after I had arrived on the Intercity Direct from Schiphol (32 mins). 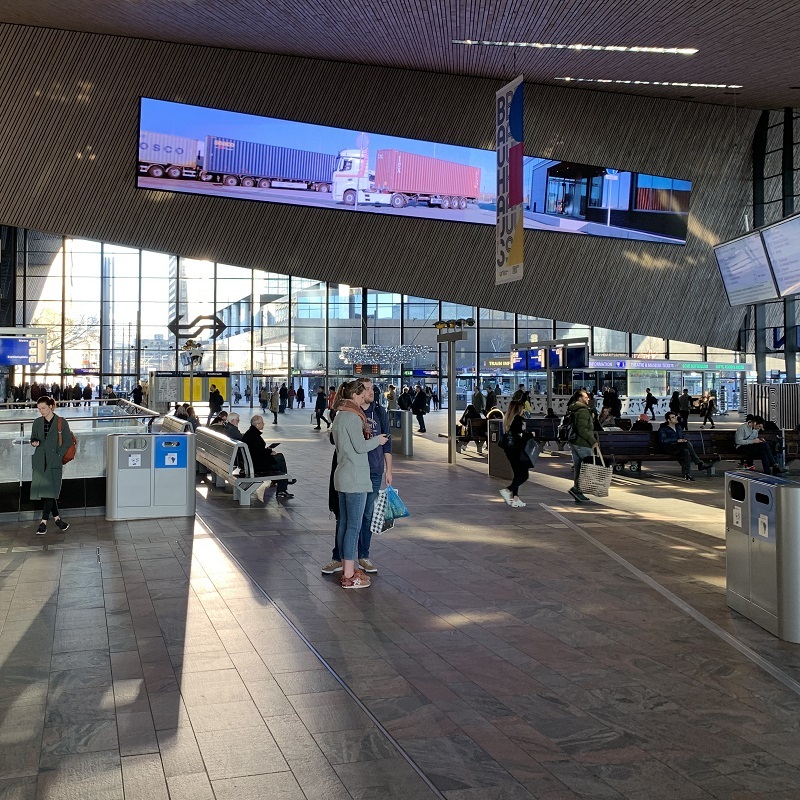 Inside Rotterdam Centraal Station. That’s a giant oblong strip of LCD TV screen at the top. 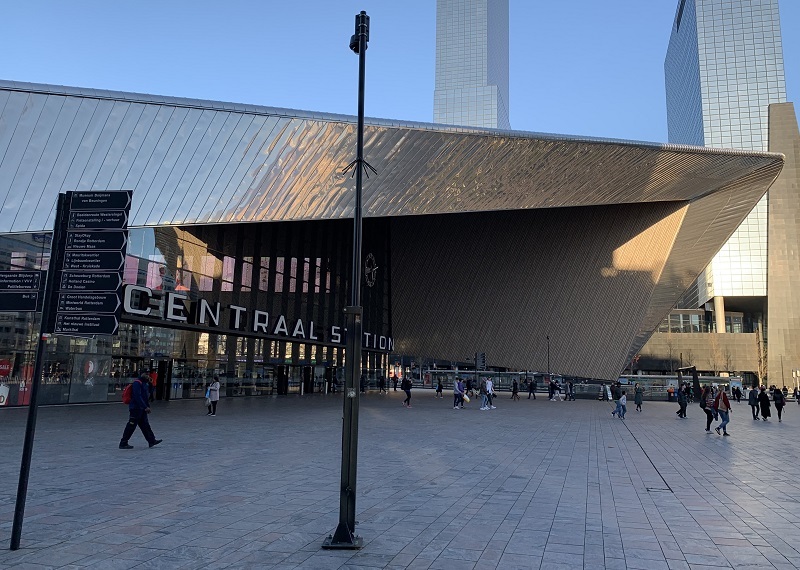 The main entrance to Rotterdam Centraal Station with its sweeping, metal-clad entrance. 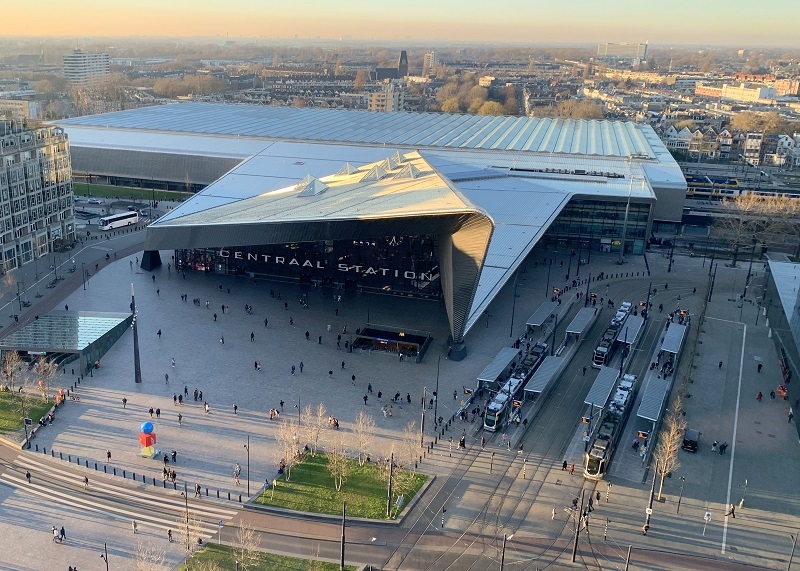 This station building was designed by a team of Dutch architects and officially opened in March 2014. Here’s a view from the 12th floor of the Marriott Hotel across from the train station, where I stay. 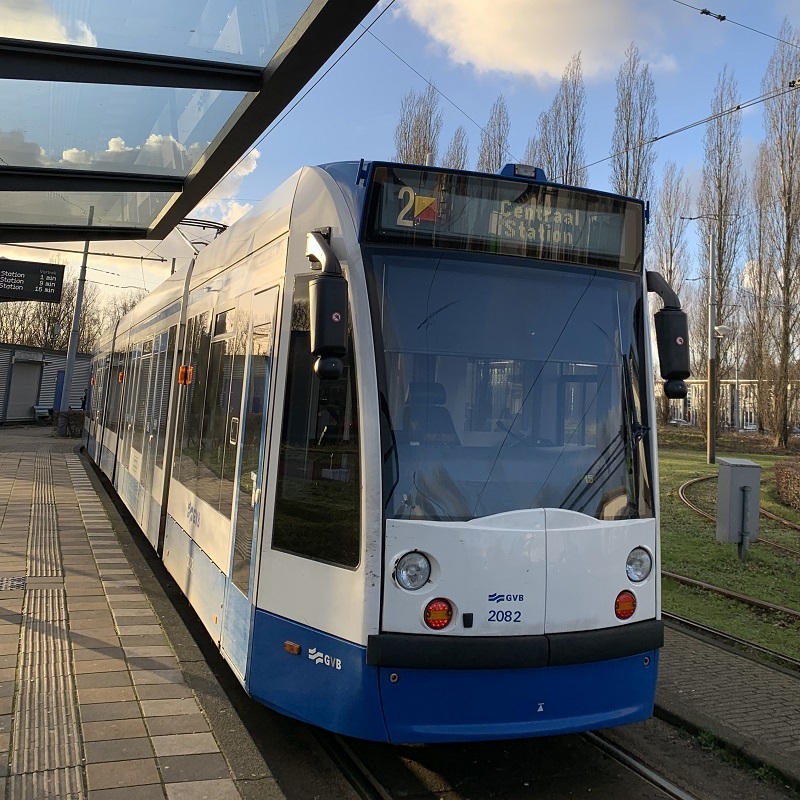 Look to the right of the picture for the street cars that stop at Rotterdam Centraal. Watch out for them! they do not stop at smaller intersections. Another hazard when crossing intersections are the bike lanes with cyclists and moped riders. Here are some of my favorite buildings in Stellenbosch, from my visit there yesterday. 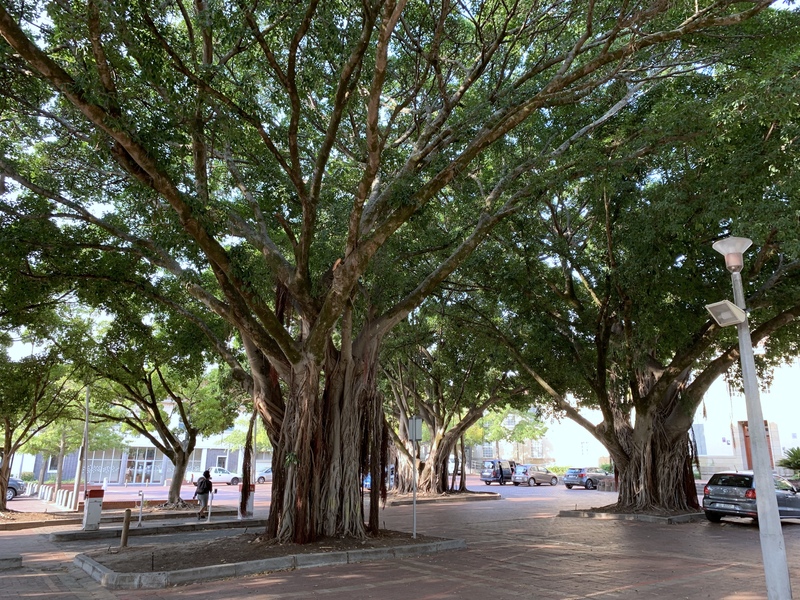 These giant ficus trees are behind the main administration buildings of the University of Stellenbosch. 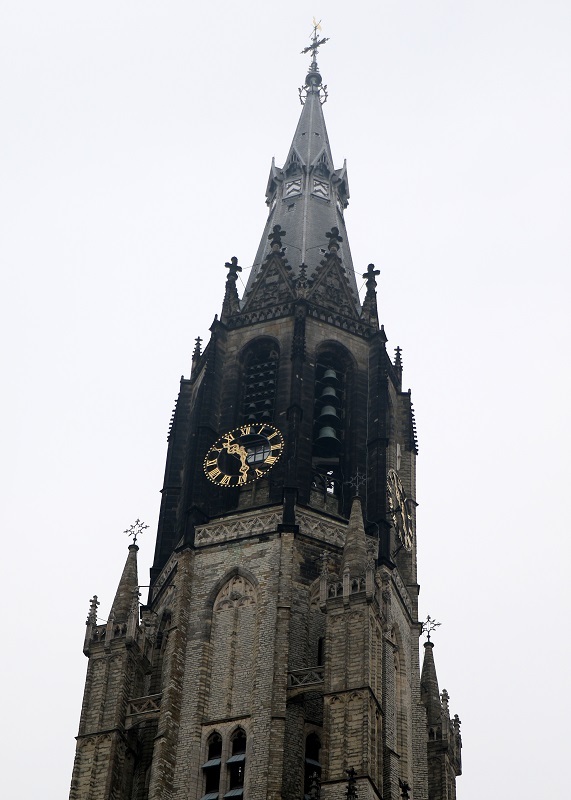 The Moederkerk (Mother Church) on Drostdy St has a neo-gothic tower designed by Carl Otto Hager from Dresden, Germany. 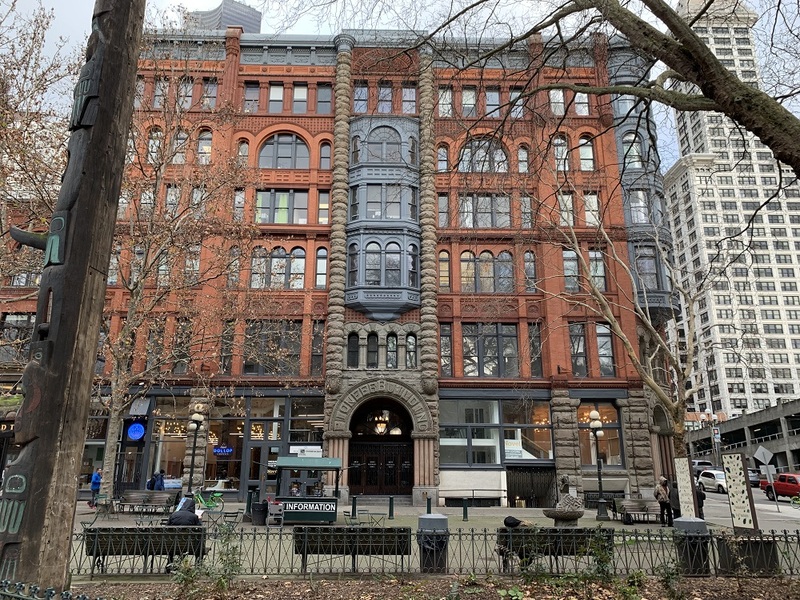 The building was completed in 1863. Erfurt House, named after the town Erfurt in Germany. 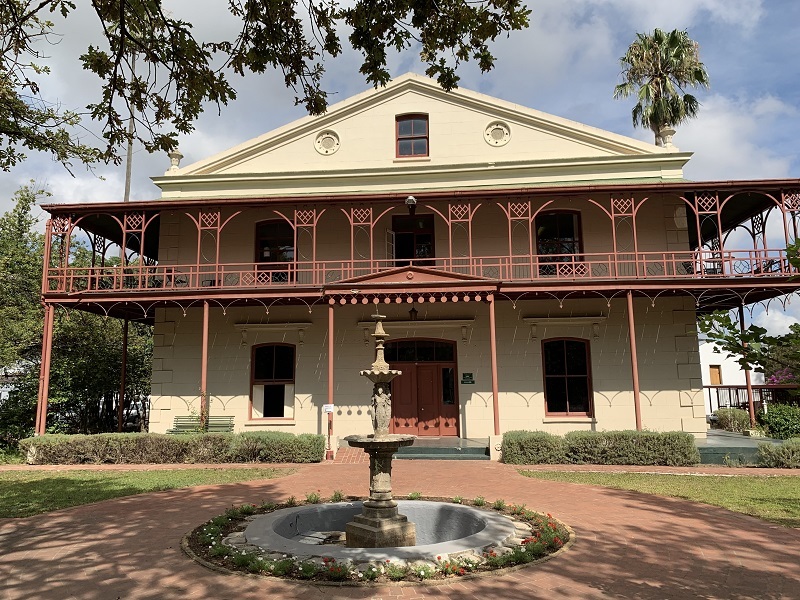 Johan Marthinus (Jan) Beyers built the imposing double story residence in 1876 with a wood and cast iron balcony on all sides of the building. 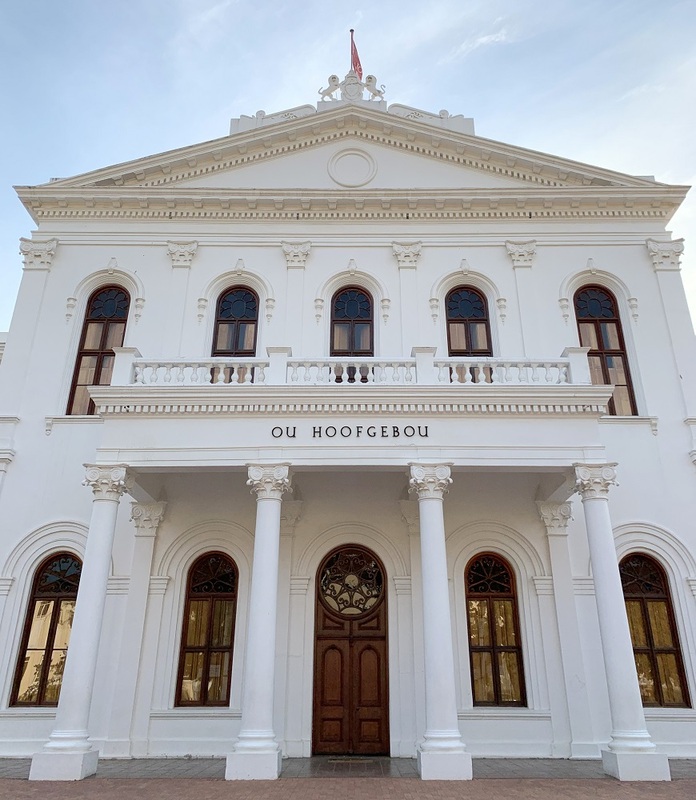 The Old Main Building (‘Ou Hoofgebou’) of the University of Stellenbosch. 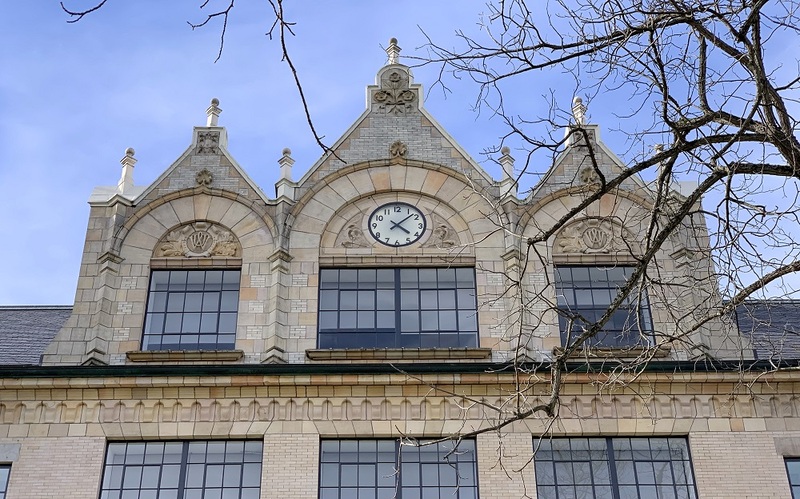 This building was also designed by Carl Otto Hager. 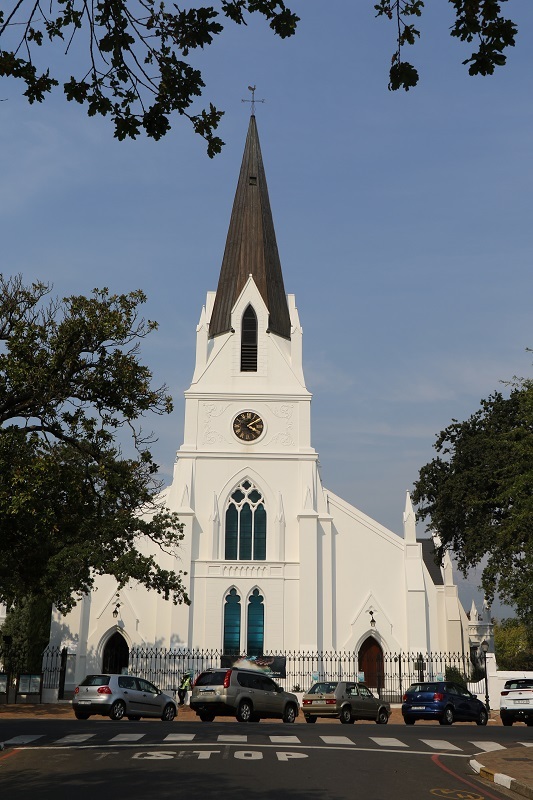 It was completed in 1883 for what was named Stellenbosch College at the time. 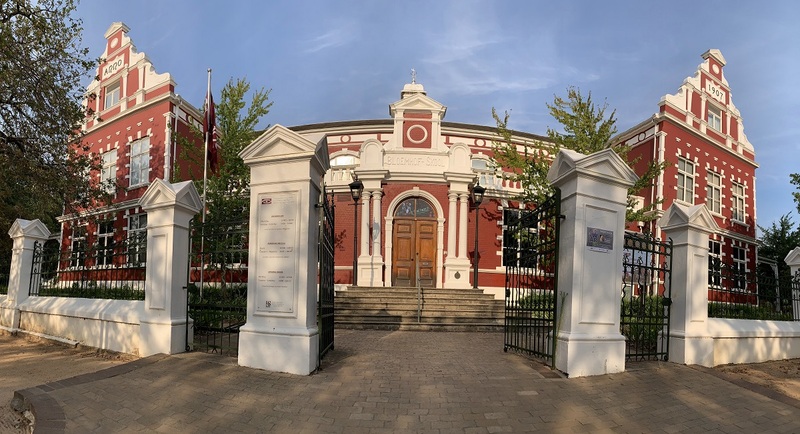 The flag on the flagpole indicates that the University oF Stellenbosch celebrated its centenary in 2018. 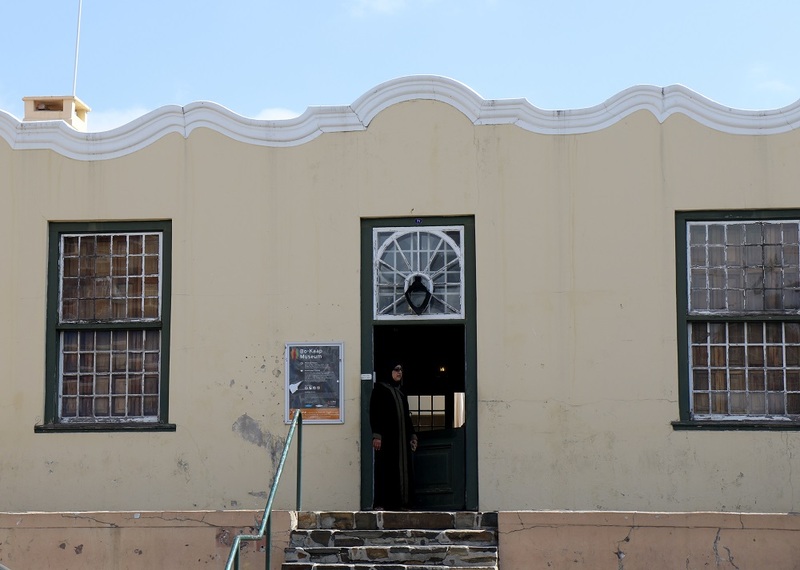 The building for the Bloemhof Girls’ High School on Andringa Street now houses Stellenbosch University Museum. 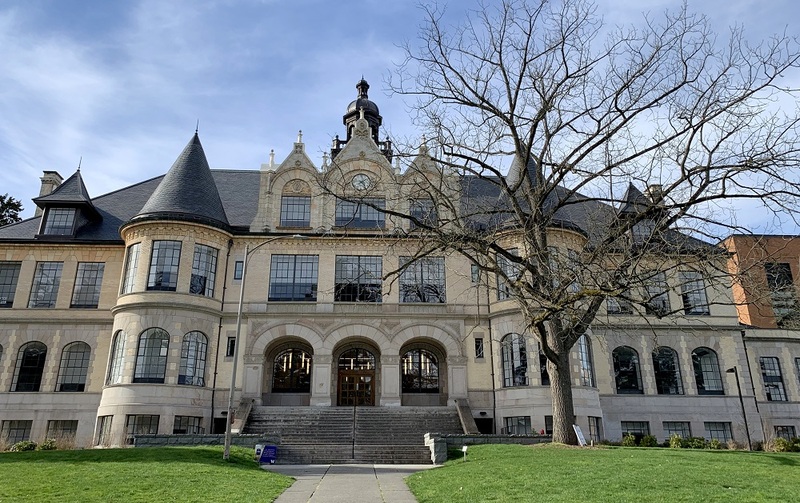 It was built in the Flemish Renaissance Revival style and completed in 1907. 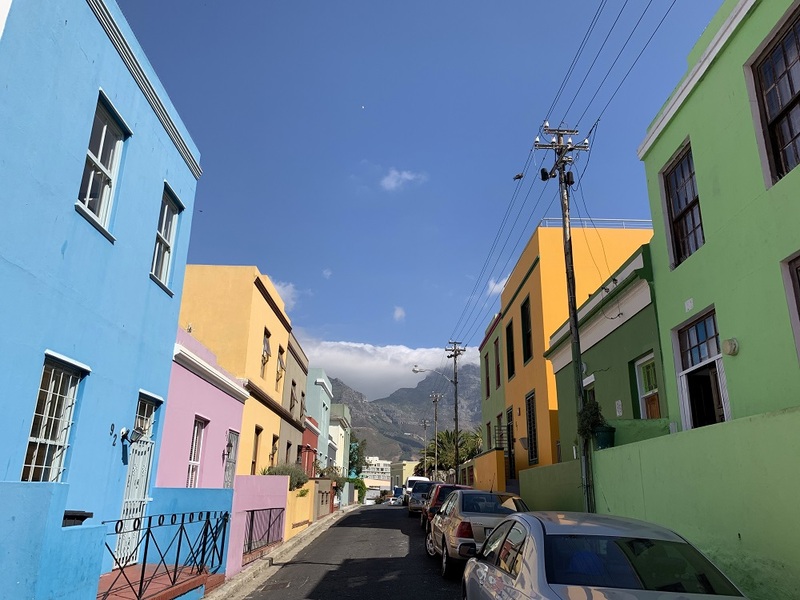 The Bo-Kaap (pronunce ‘boo-uh-carp’) is a former township on the slopes of Signal Hill, above the Cape Town city center. 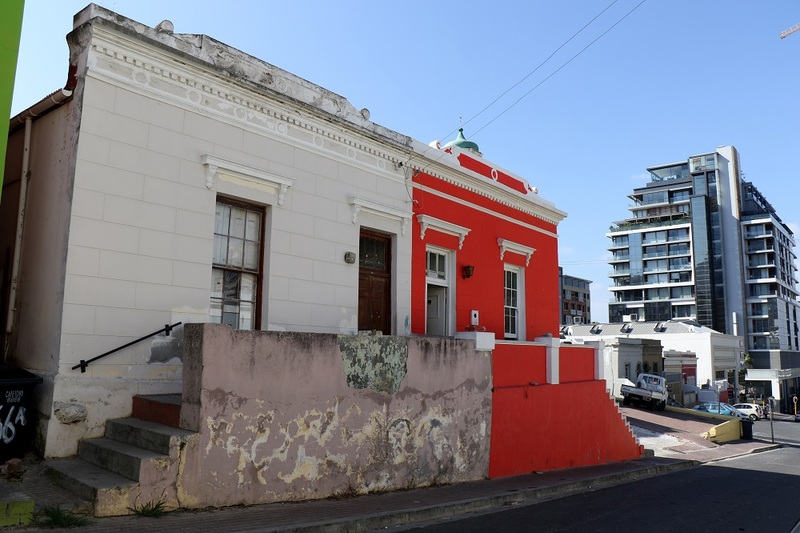 It is the historical center of Cape Malay culture in Cape Town. The Nurul Islam Mosque, established in 1844, is also located in the area. 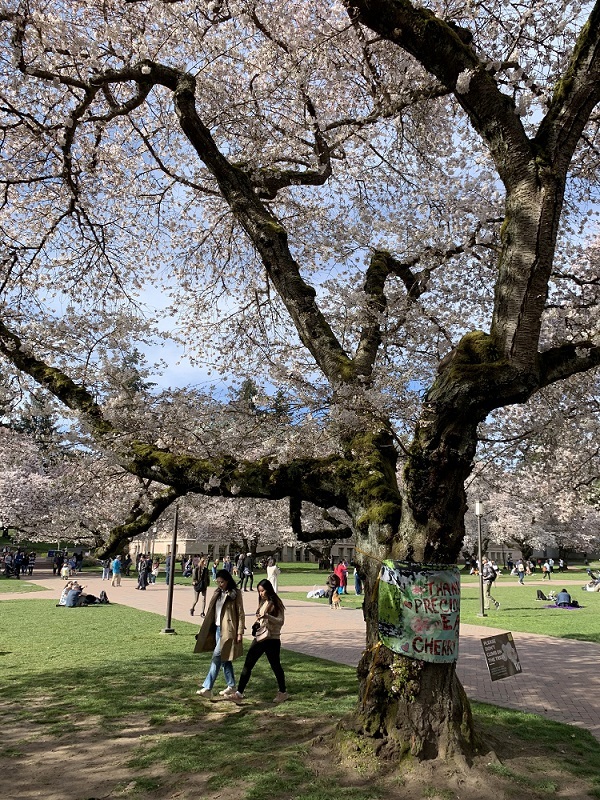 Here are a few pictures that I took today. This is a scene on Wale Street. I love the Volkswagen Beetle with the blue doors. The backdrop is Table Mountain, of course. 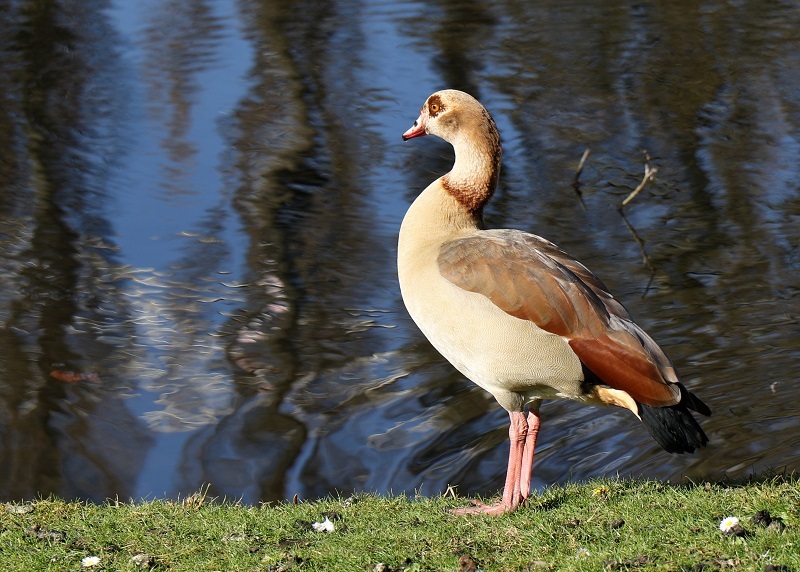 Gorgeous dark green and – Salmon? Coral Pink? houses on Wale Street. 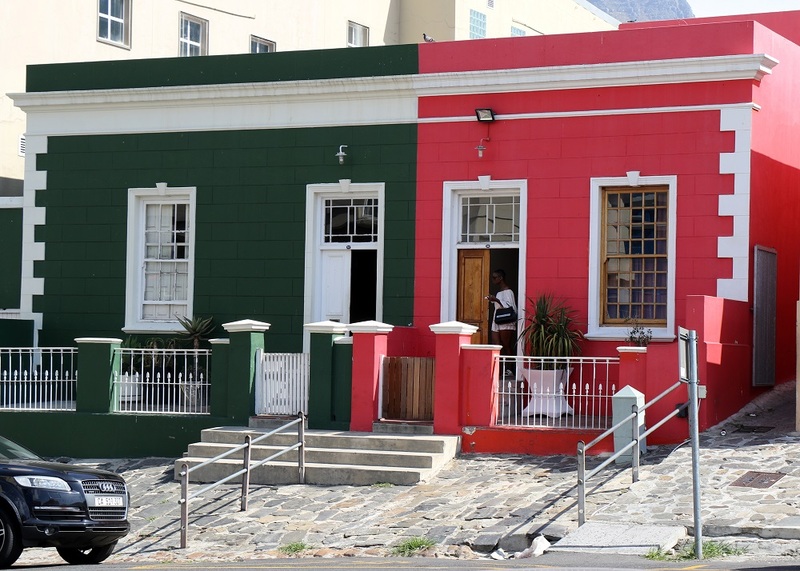 This is the entrance to the Bo-Kaap Museum on Wale Street. I love the wavy cornice on the roof line. 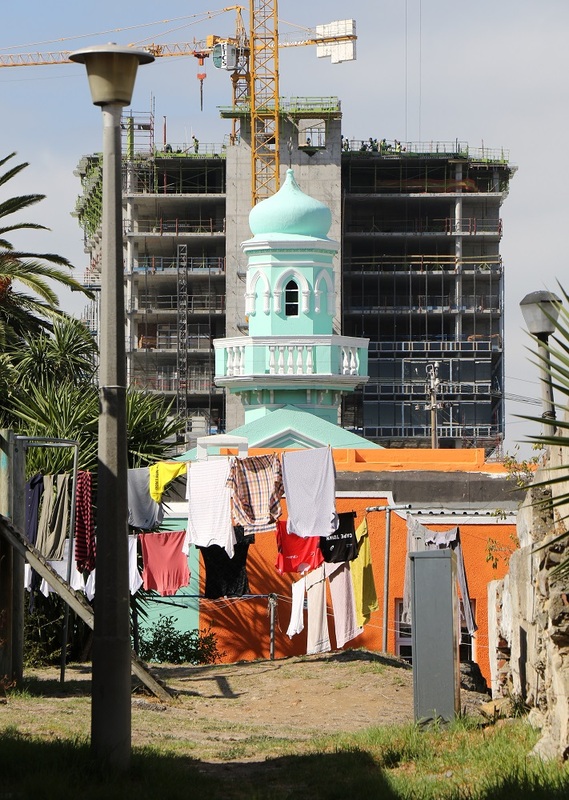 The minaret of the mosque called Masjid Boorhaanol Islam on Longmarket St, holding its own against a massive development project a few blocks away. 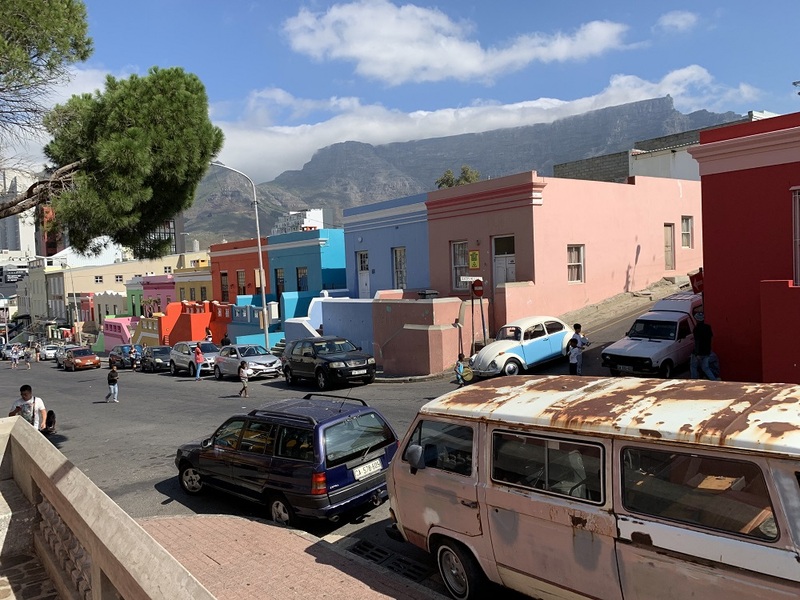 Efforts to designate Bo-Kaap as a heritage area have been underway since 2013, and it may finally be approved this year by the Cape Town City Council. 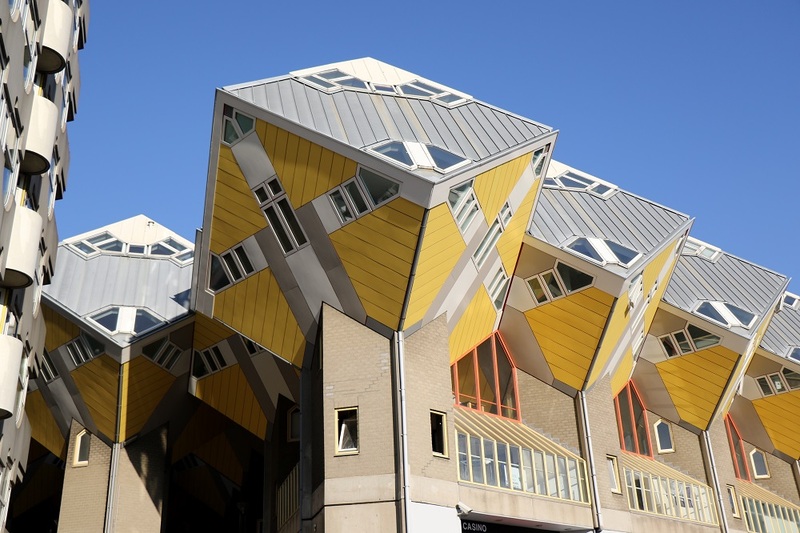 Still, the status does not entirely prohibit new construction; it simply stipulates that new construction should be subject to much more scrutiny to ensure it fits in with the existing structures. 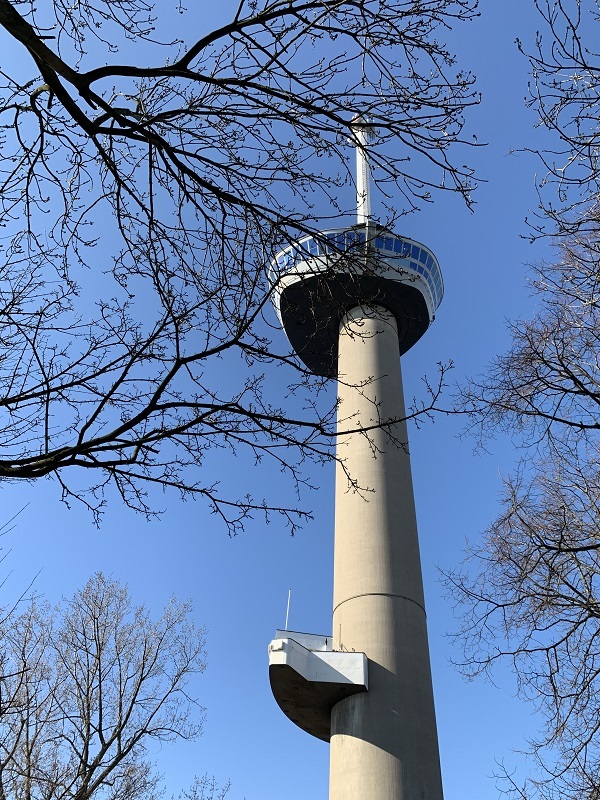 A view of the old and the new. This is on Chiappini Street. 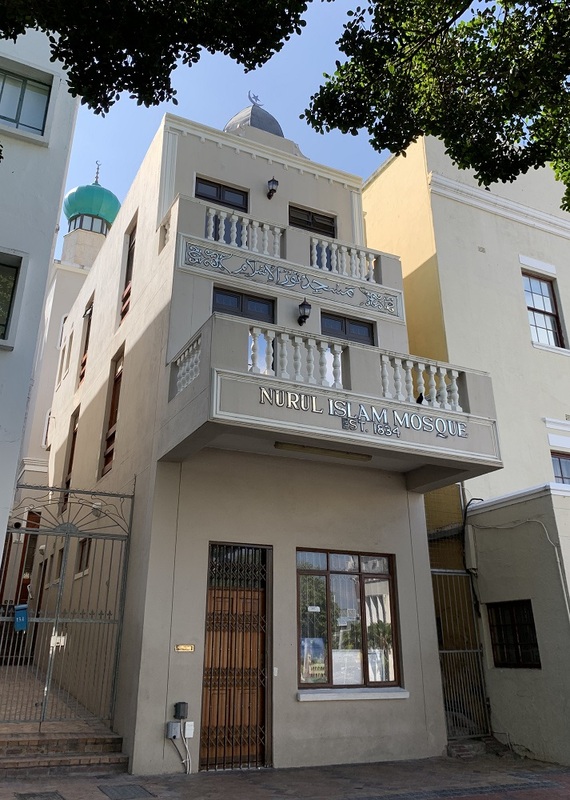 Here is the Nurul Islam Mosque, located off Buitengracht Street, and established in 1834. 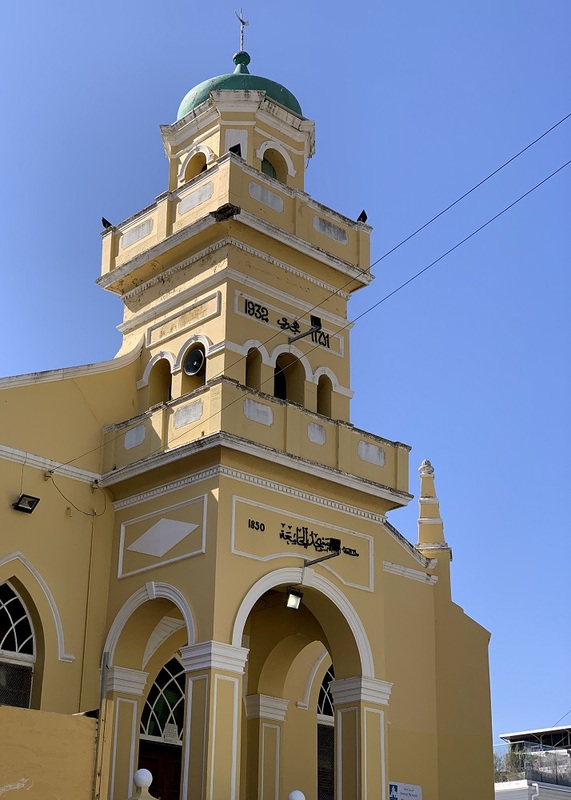 The Jameah Mosque on Chiappini Street was built in 1850. It is also known as the Queen Victoria Mosque, as patronage of the British Crown, when the Cape Colony was under British rule. I am at Narita airport, waiting to board my flight. I took a quick taxi to Tokyo Station (too much luggage to use the subway! ), and then the Narita Express train from there. 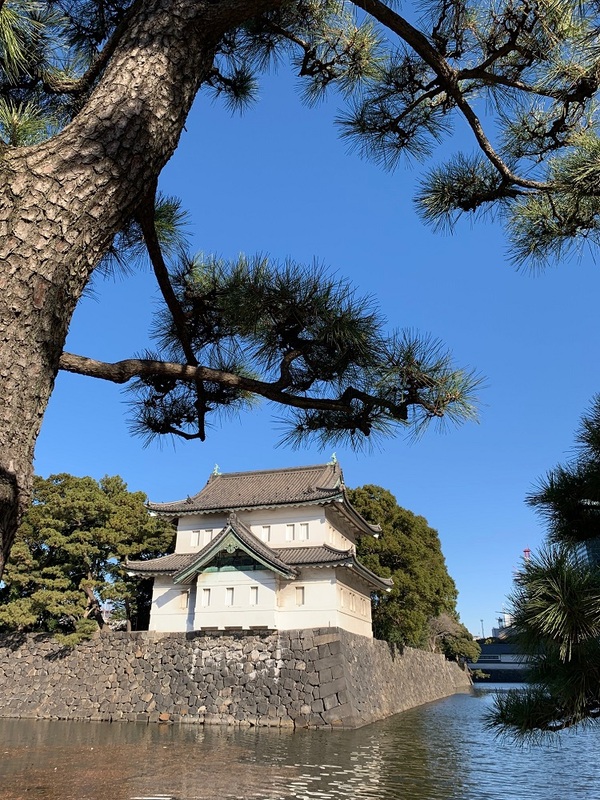 From my walk this morning before leaving for the airport: one of the outposts of the Imperial Palace (old name: Edo Castle). 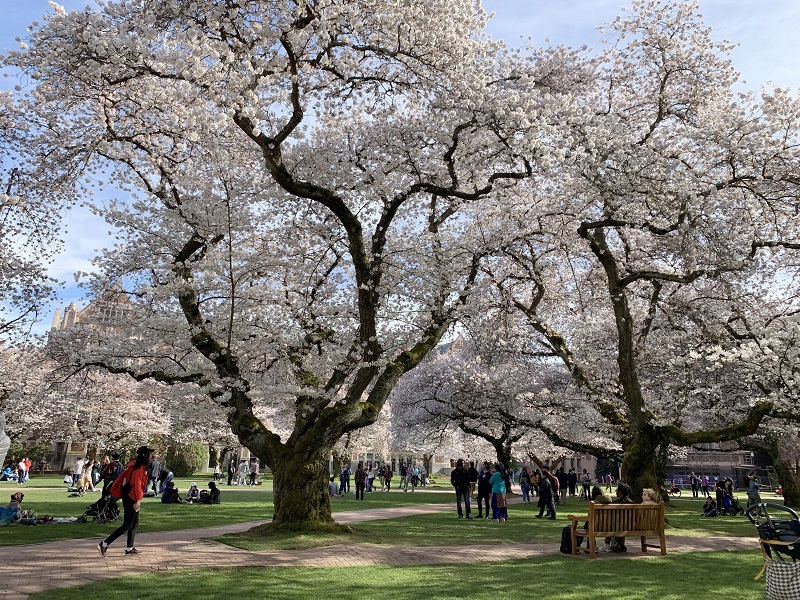 The Palace is located in a large park-like area near Tokyo Station, and is the primary residence of the Emperor of Japan (currently Emperor Akihito, age 85). Today was my last full day. I will head out to the airport after lunchtime tomorrow. 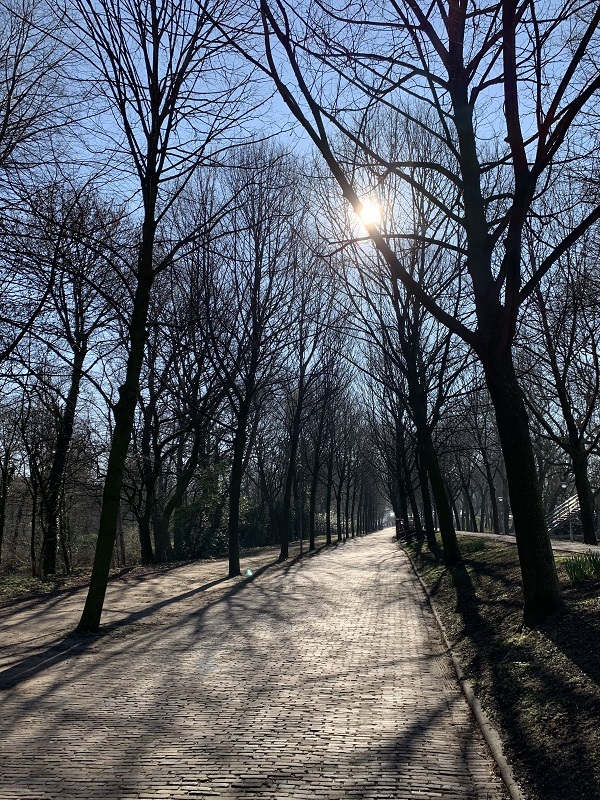 It was gloves-scarf-skull cap weather: no sun and only 6°C/ 42°F for a high. 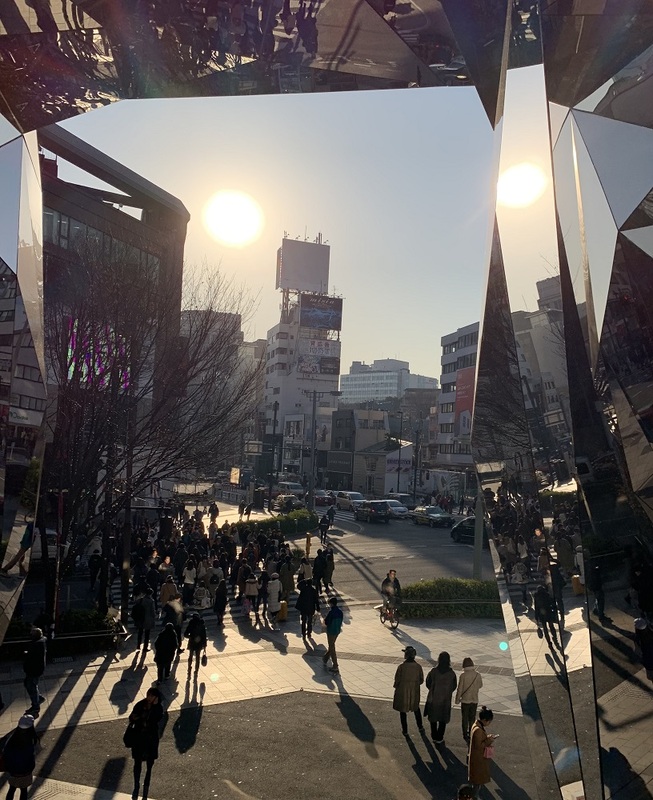 I went out to the very touristy surroundings at Asakusa Station (pagodas and shrines), and then made a stop at Omotesandō Station (glass and steel) as well. 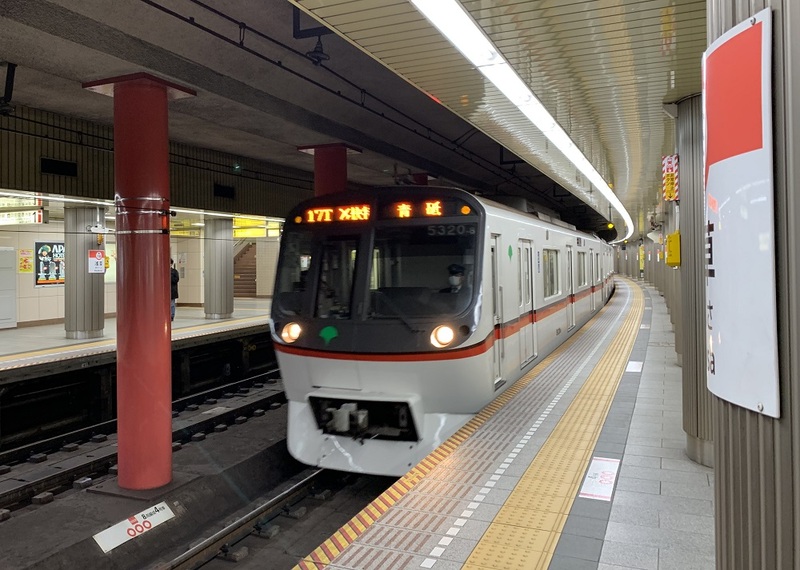 Here comes the next train, this at Asakusa station. 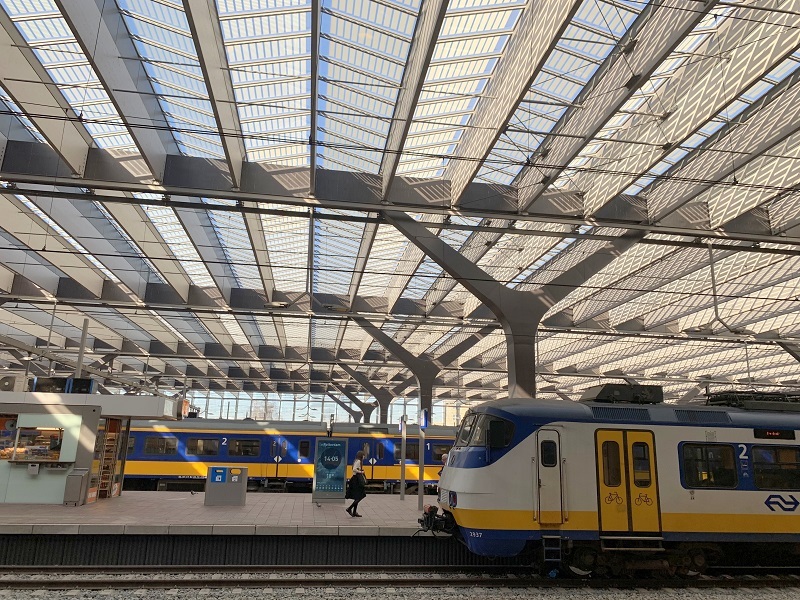 For once, there are no fencing panels, and no humans on the platform that spoil the clean lines of the picture :). 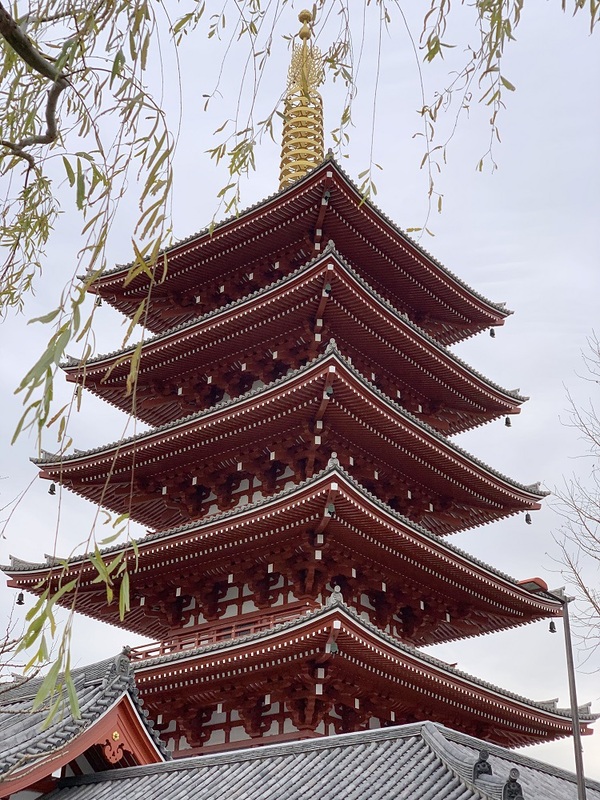 This 5-story pagoda near the Sensoji Temple in Asakusa, is a 1973 reconstruction of the 942 original which was itself rebuilt in 1648. At 53 m/ 173 ft high, it is the second tallest pagoda in all of Japan. On to newer constructions, though! 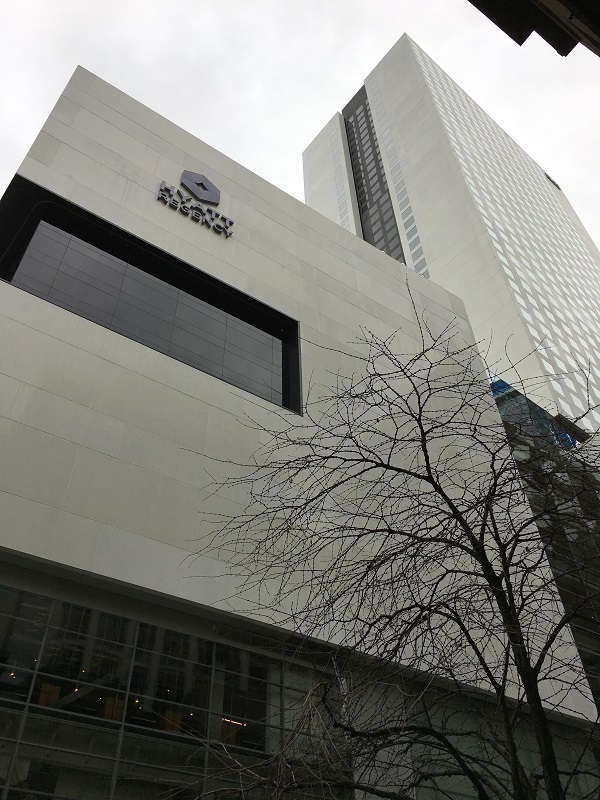 This is the AO building in Aoyama, completed in 2008, and designed by renowned architectural firm Nihon Shikkei. 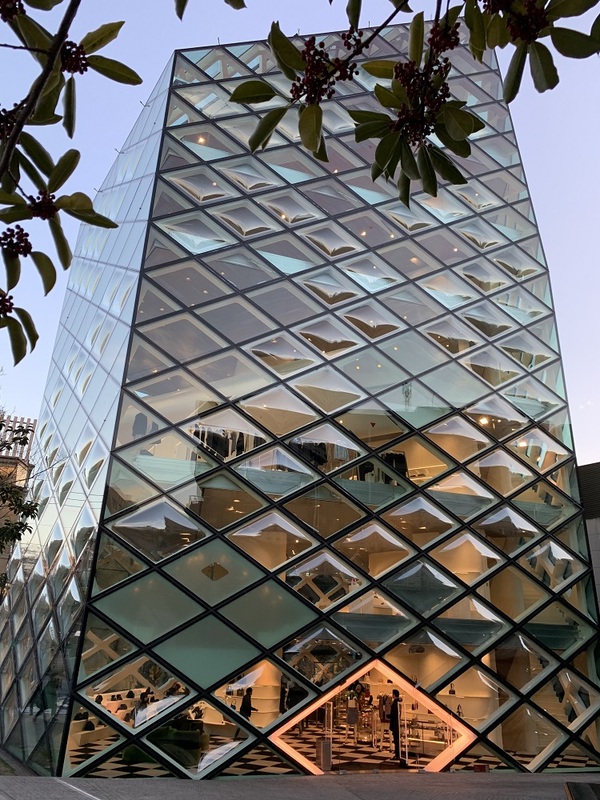 And how about the 6-story crystal glass tower nearby, showing off Italian luxury fashion house Prada’s offerings? 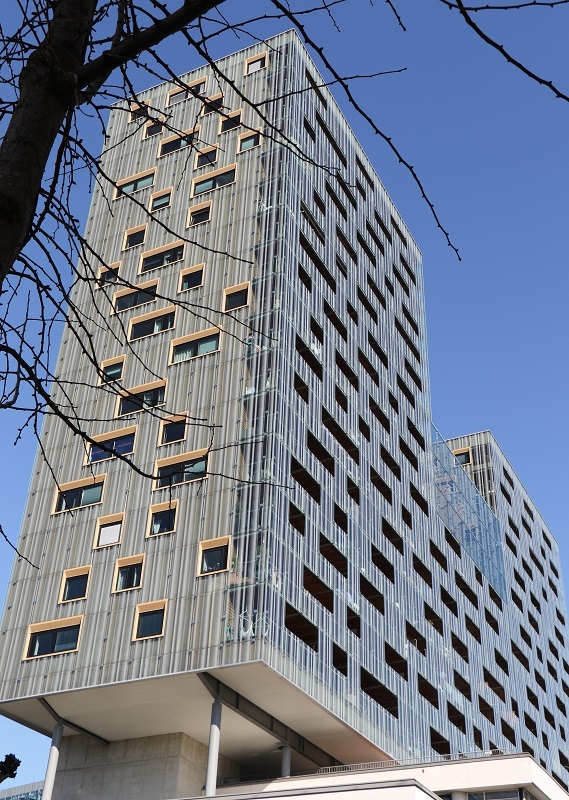 Architects Herzog & de Meuron, constructed 2003. 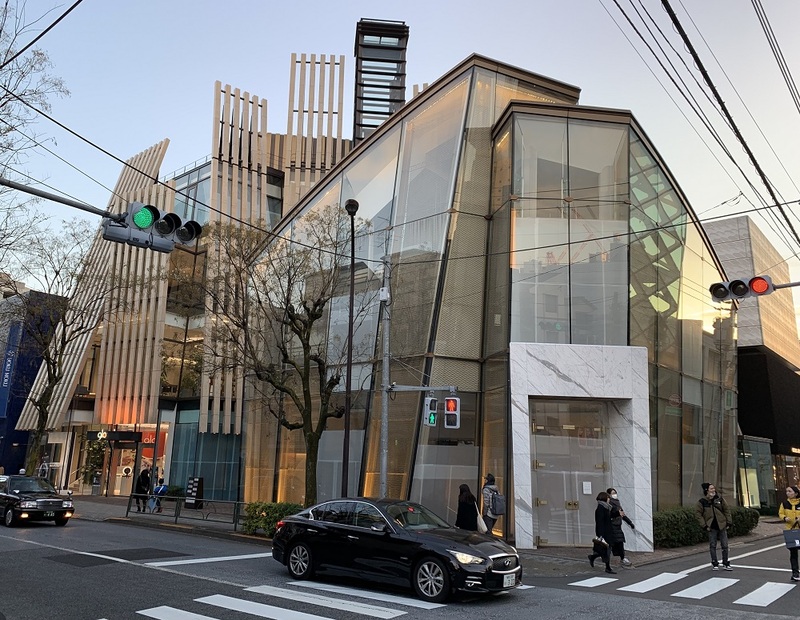 Across the street, there’s a La Perla store on the corner (high-fashion lingerie, loungewear, bridal intimates & sleepwear), and an Anya Hindmarch store behind it (English fashion designer). 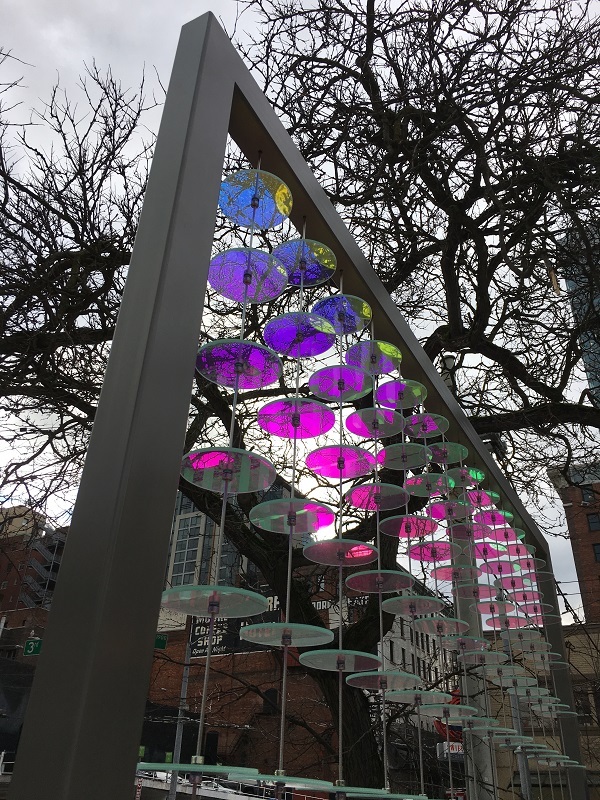 If you’re going to convince well-heeled people to part with lots of money for their threads, you’d better have some eye-catching store fronts, right? 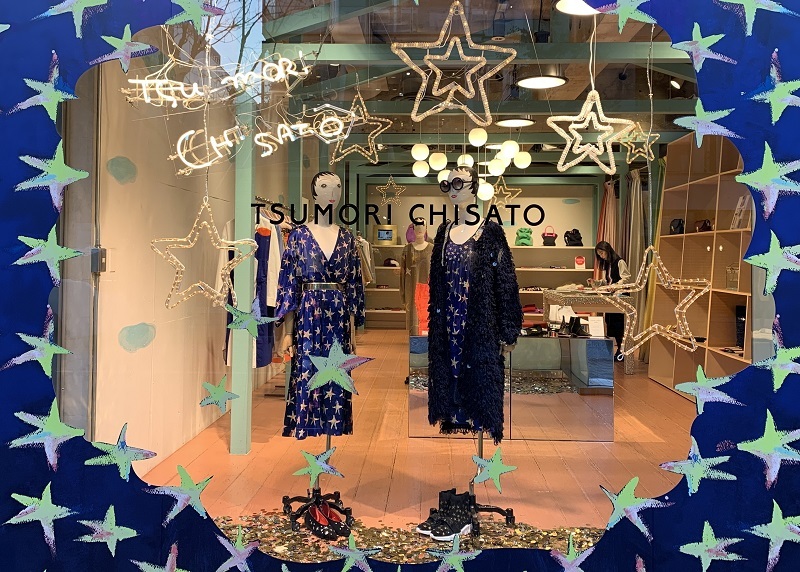 Tsumori Chisato (64) is a Japanese fashion designer, an ex-collaborator with famous Japanese designer Issey Miyake (80). 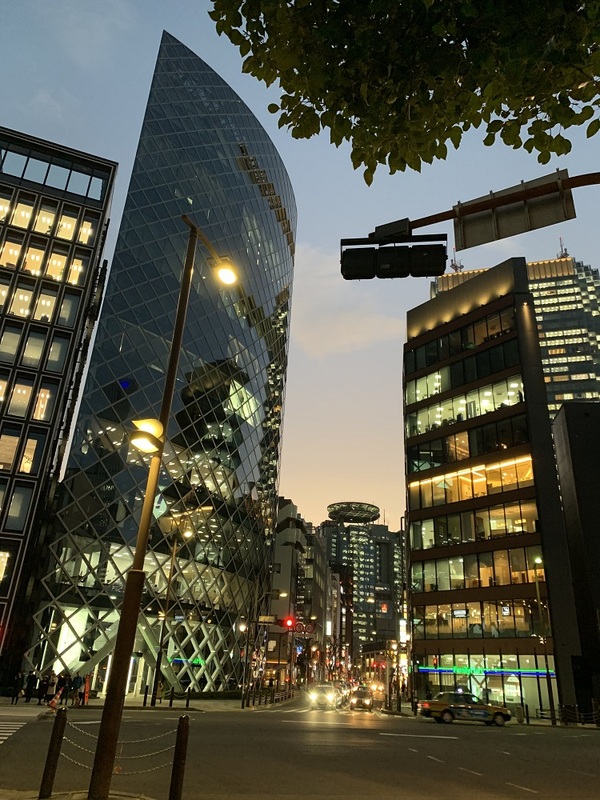 My last stop for the day was at Akasaka (not the same as Asakusa!). Nice vanishing edge on the SKI building (infotech office tower) on the left. 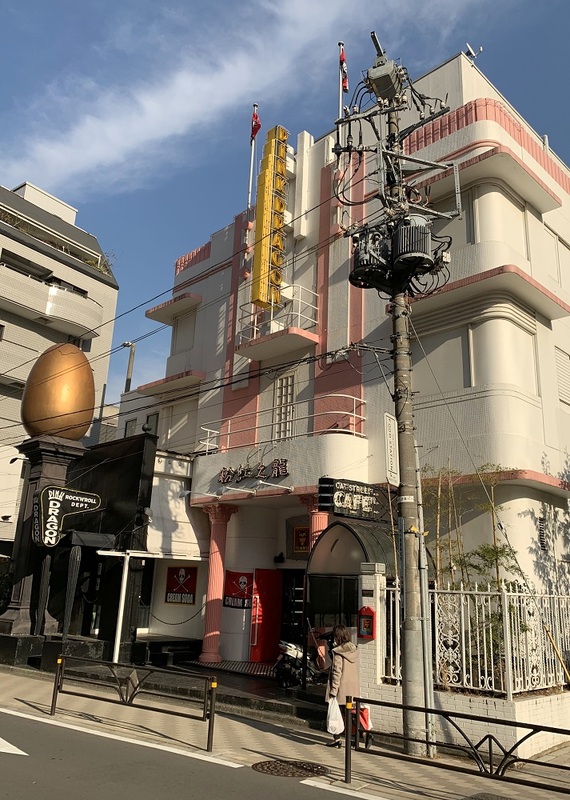 I spotted some unusual buildings along Meiji-Dori avenue today, while walking from Shibuya to the Harajuku station. Some days I run myself ragged with too much walking! So for tomorrow, I plan to take the Nozomi Super Express to Nagoya. It’s 1h 40m in one direction. The not-quite Art Deco building for the Pink Dragon store sells 1950s retro clothes, accessories and clocks. Down below is Cat Street Cafe, and a golden egg perched on a pillar .. but what that stands for, I am not sure! 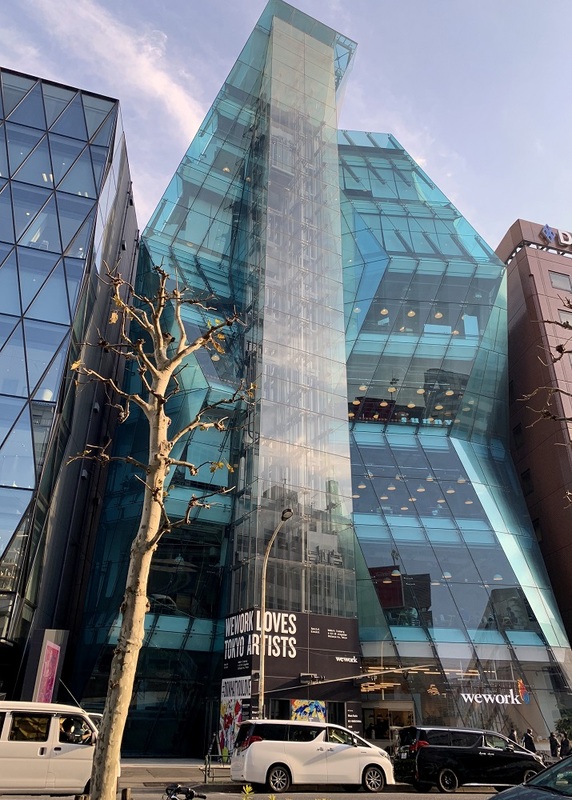 Here is the swank new WeWork co-working space called The Iceberg, which opened in Aug 2018. They have offices around the world, also in Seattle. An older apartment building near Harajuku station. 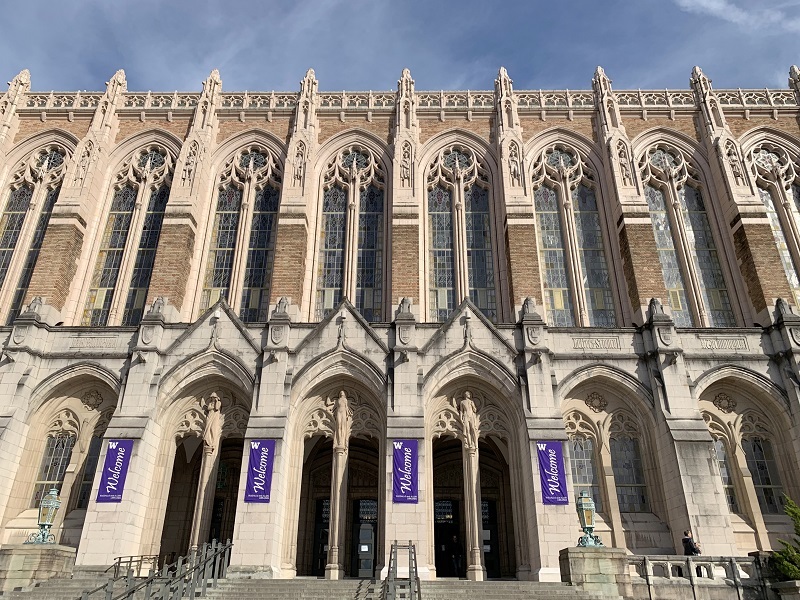 I don’t know the name – I just liked the angled columns of bay windows. 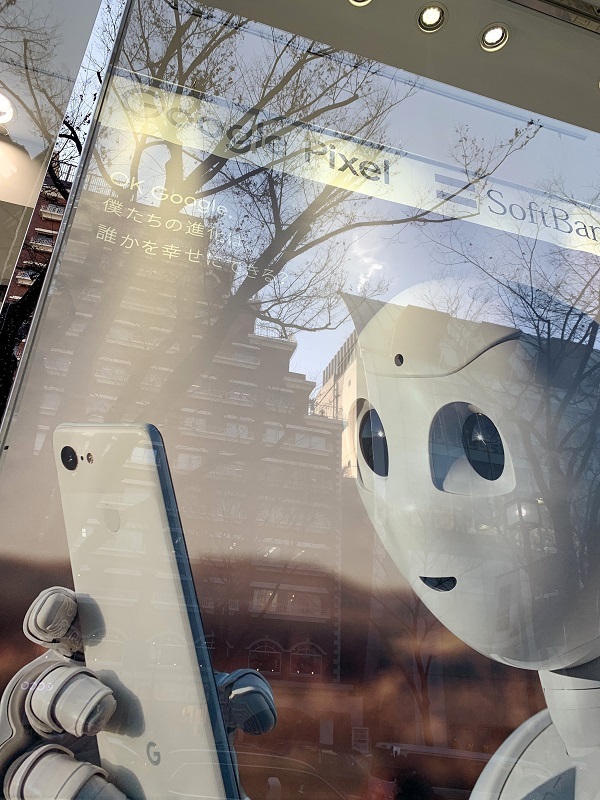 A window display that shows Pepper the robot* coming to grips with his new Google Pixel 3 smartphone. (Does he ask: ‘OK Google, who is the smartest robot?’ ?). *Manufactured by SoftBank Robotics. 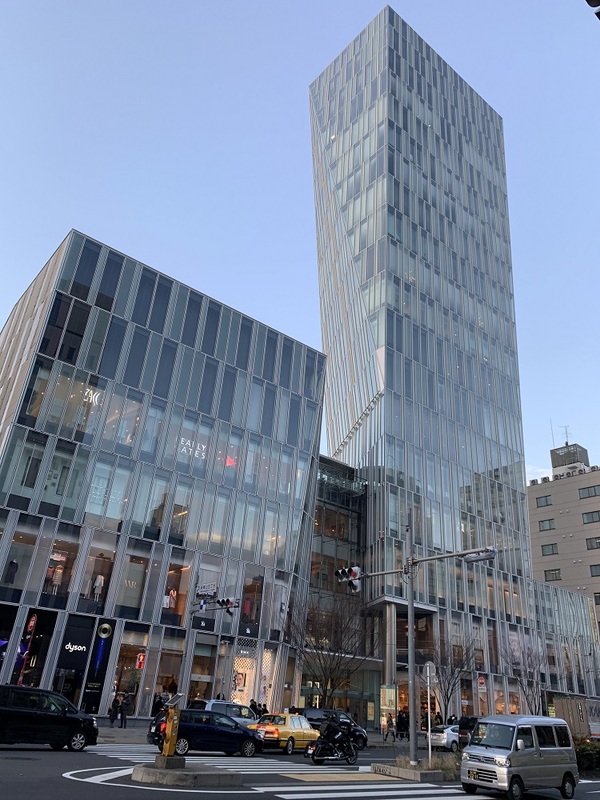 The Tokyu Plaza shopping mall near Harajuku station has a faceted entrance covered with mirrors. It is only 3 pm, but the sun is already low. It sets at 4.40 pm. 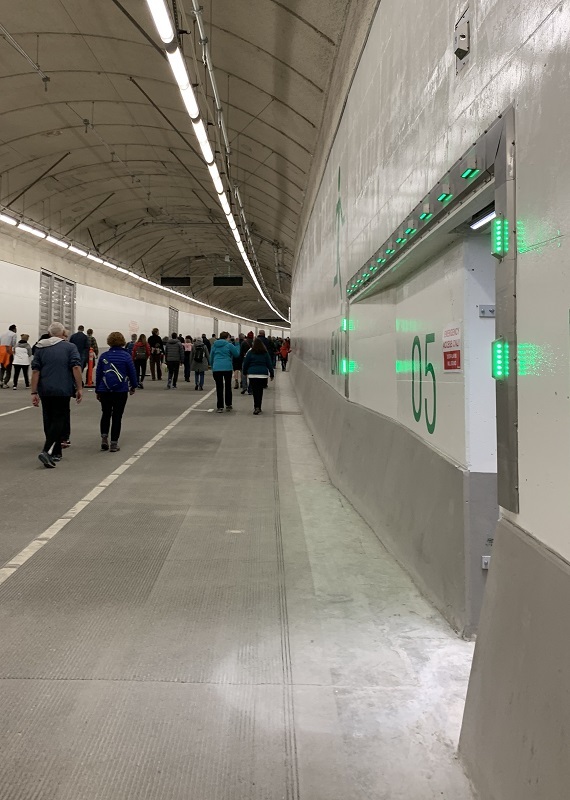 I took the train from Bull Creek Station to Perth Underground station today – it’s only 11 minutes. 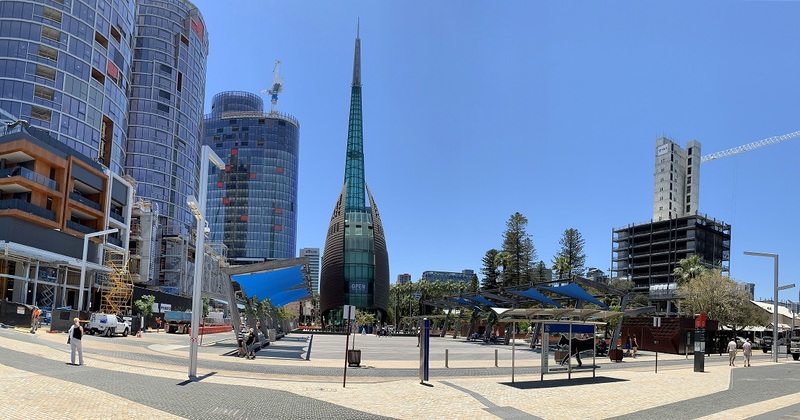 The Western Australian economy must have picked up steam the last two years, because there is a lot of new construction going on in downtown Perth. 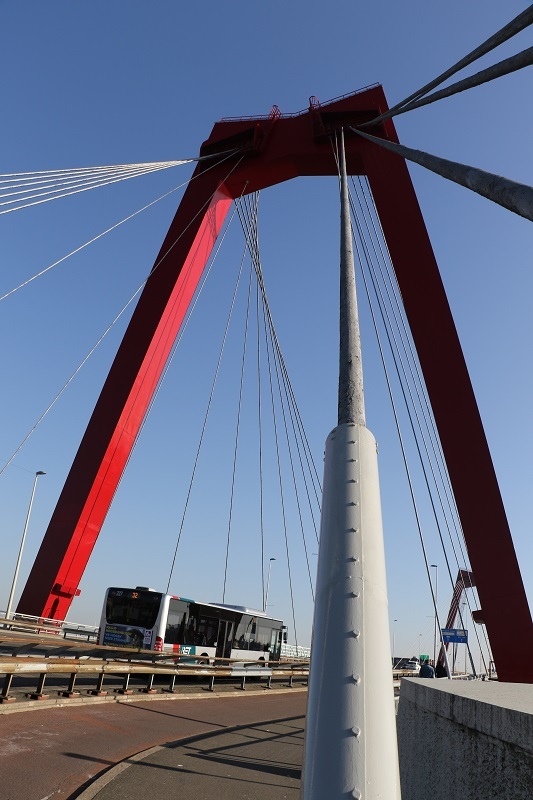 Here is the landmark Bell Tower (built 1999), surrounded by the Elizabeth Quay construction which is coming along, but not quite completed yet. 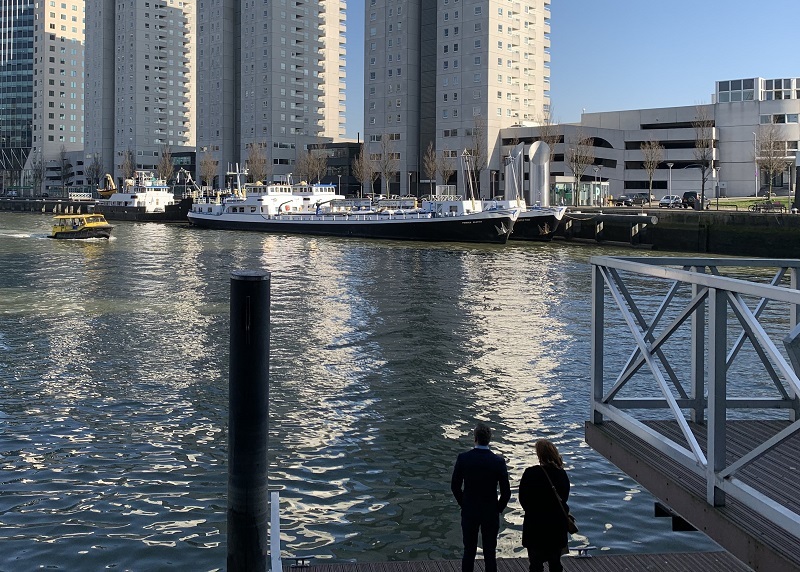 Those oval towers on the far left are the The Towers at Elizabeth Quay, and offers 1-, 2- and 3-bedroom apartments for sale. The 3-bedrooms go for AU$1.2 million (US$ 860,000). 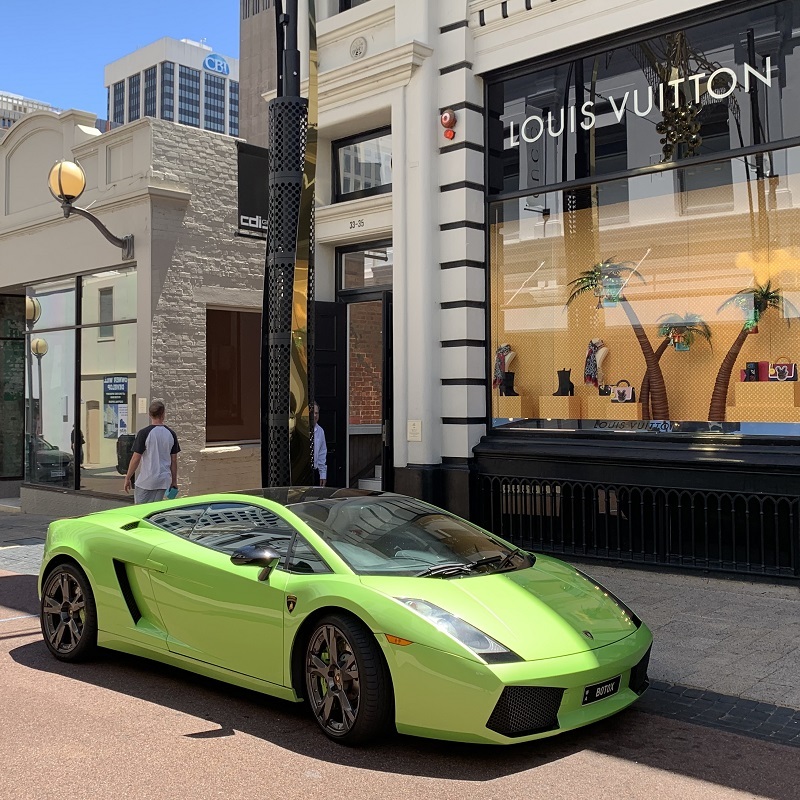 This lime-green Lamborghini (‘Lambo’) in front of the Louis Vuitton store has a plate that says ‘BOTOX’ .. is it a tongue-in-cheek joke? Does the owner love Botox? I don’t know. 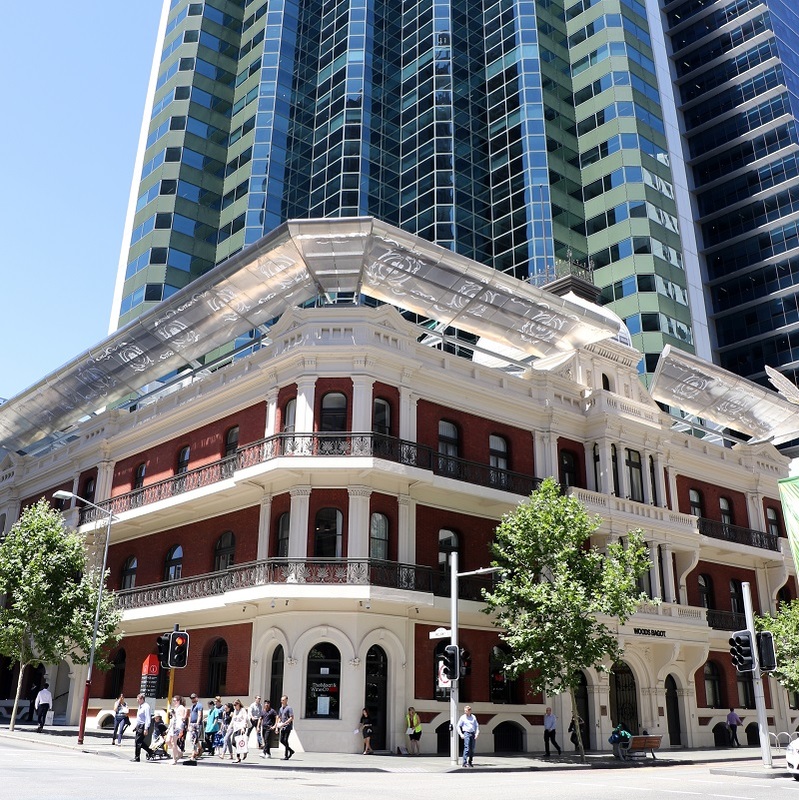 Here is the old Perth Palace Hotel on the corner of William St and St George’s Terrace (built in 1897 during the Australian gold rush). Behind it is the BankWest Tower, completed in 1989 ‎(52 floors, 214 m / 702 ft). 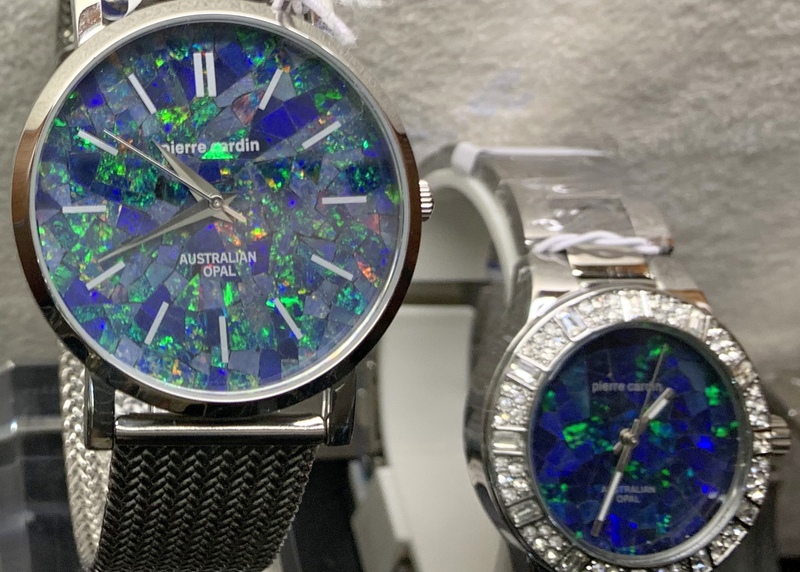 I found this opal watch at the Perth Mint. Nice to look at, I’m not sure I like it well enough to wear it on my wrist. 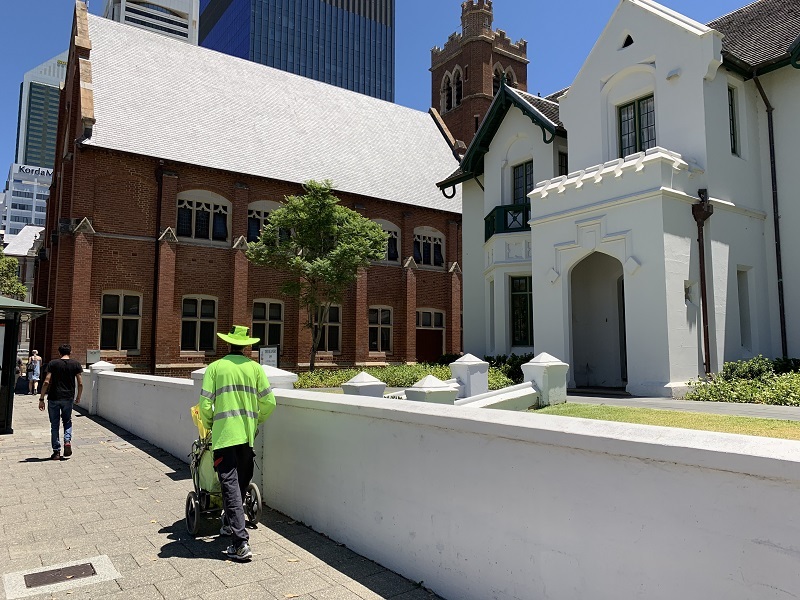 Here is the mail man (in the neon green), about to stop at the gate of the annex (the white building) to St Mary’s Cathedral. 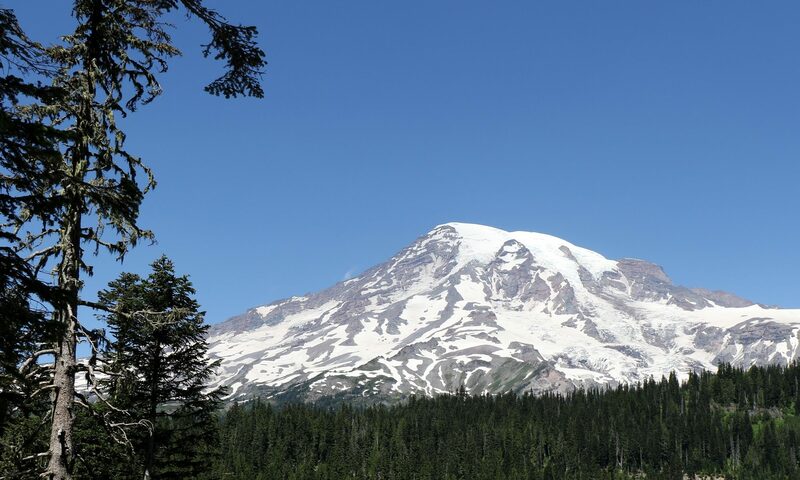 It was warm today: 33 °C/ 92°F. 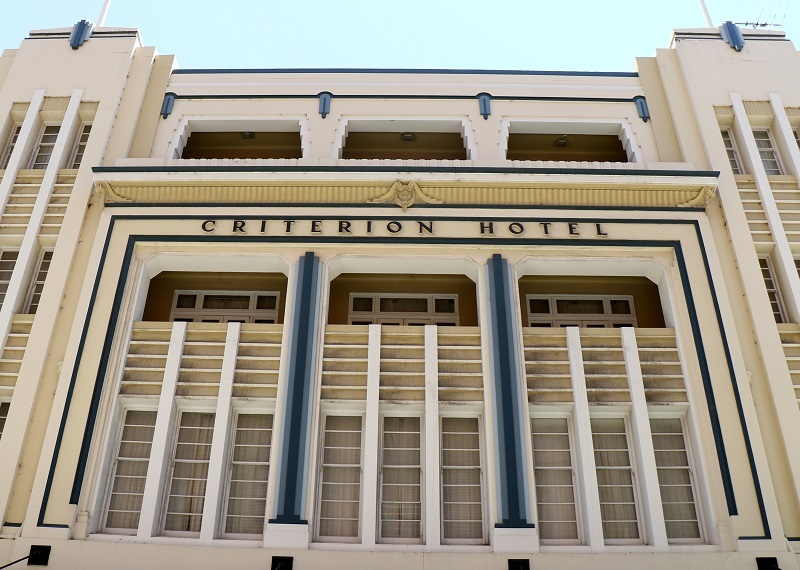 The gorgeous building of the Criterion Hotel, formerly the Regatta Hotel, is a hotel in Perth, Western Australia. It is the only remaining Art Deco hotel in the Perth Central Business District. [Source: Wikipedia]. 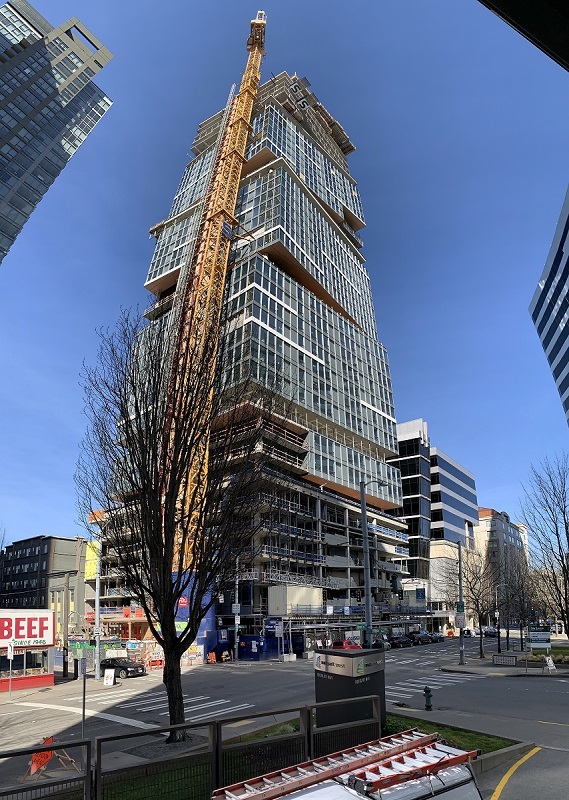 The Rainier Square Tower (59-story, 850 ft/ 259 m tall) in downtown Seattle, is getting off the ground, with its completion scheduled for early 2020. 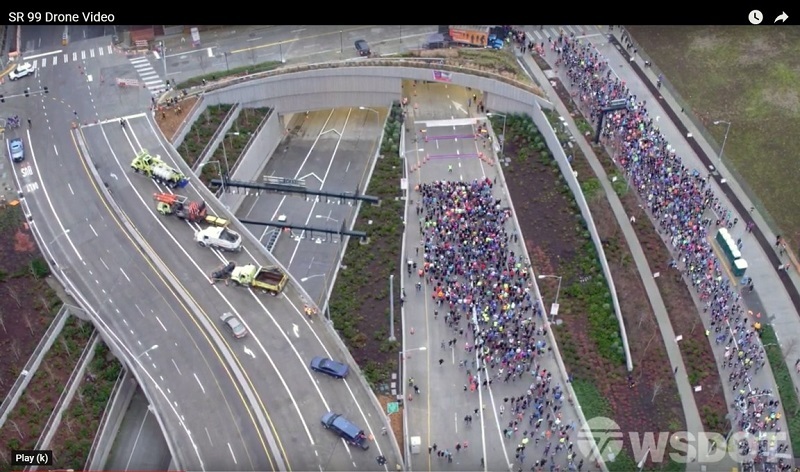 Traditionally, a rebar-reinforced concrete core has been the preferred method of construction for Seattle’s towers. These cores are very good at bracing against wind and seismic loads. 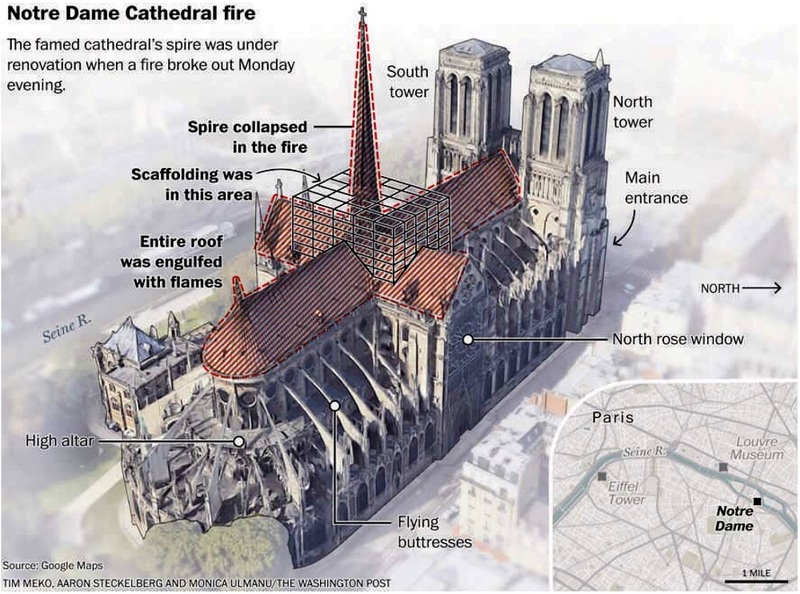 The construction process is slow, though: three to four days per floor, with the steel framing for each floor dependent on completion of the concrete work. 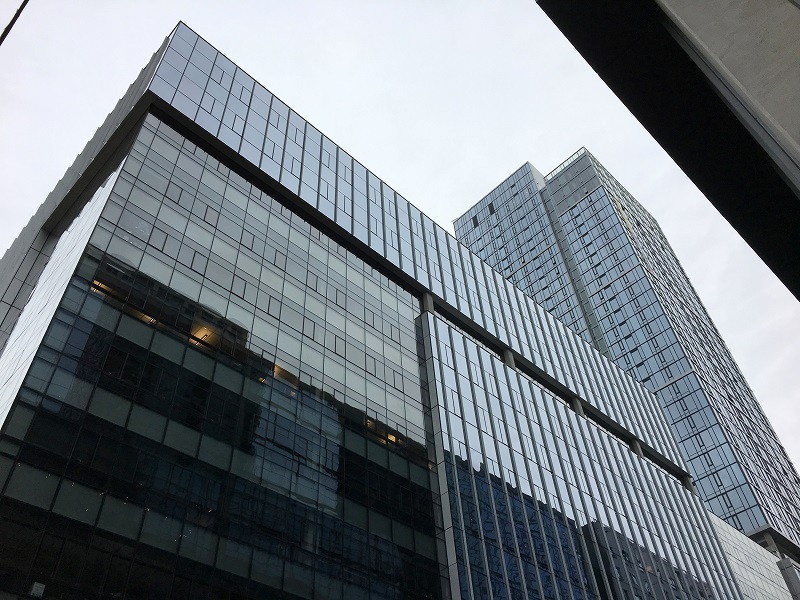 For Rainier Square Tower, a new steel plate & concrete composite fill design for its high-rise core is used. 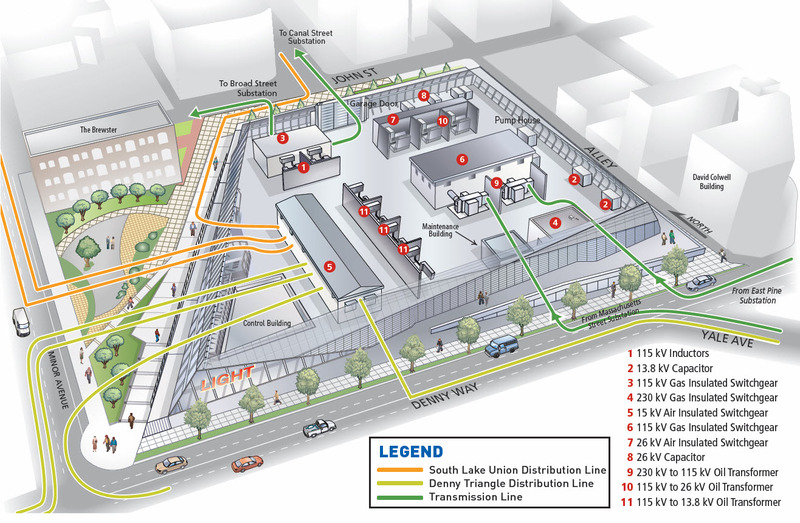 It has been developed by Magnusson Klemencic Associates (MKA) over many years. 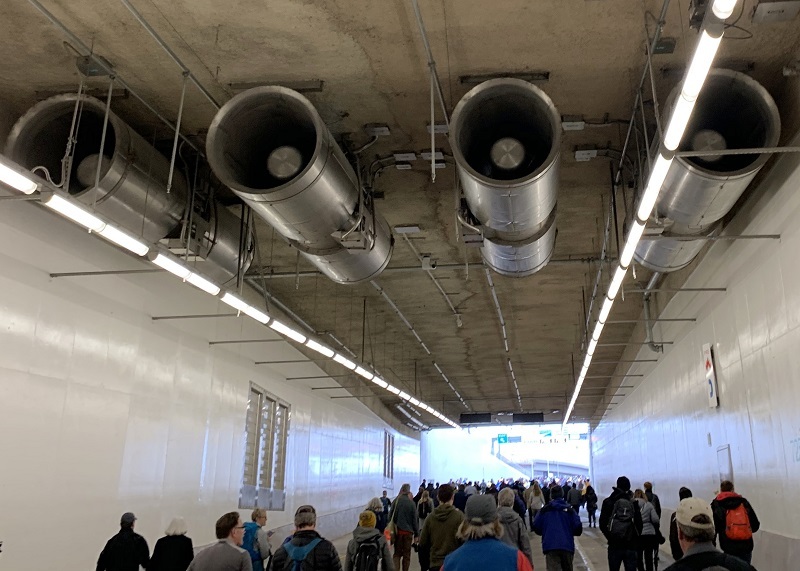 The system uses two steel plates connected by steel spacing ties, and then the cavity between the plates is filled with high-strength concrete. An added boon is that this method is expected to reduce traditional construction time by 30% or more. 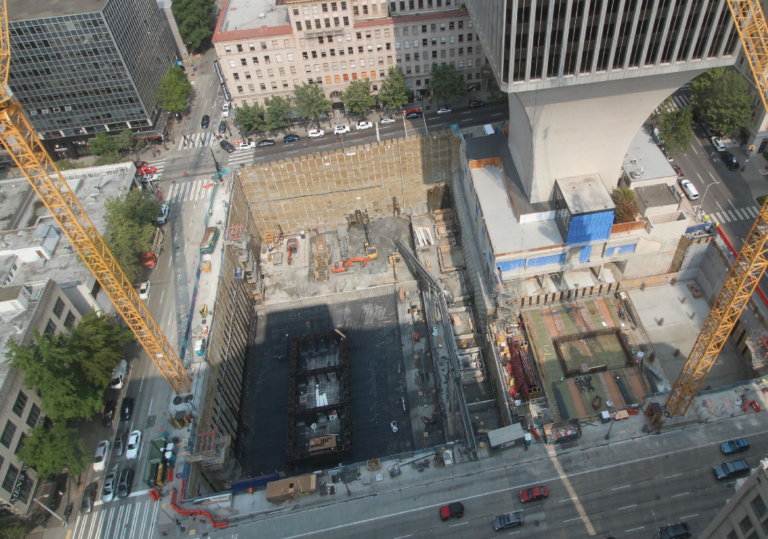 Here’s the current snapshot of the Rainier Square Tower construction cam, showing the carefully excavated hole and the first steel plates for the tower’s foundation and core. 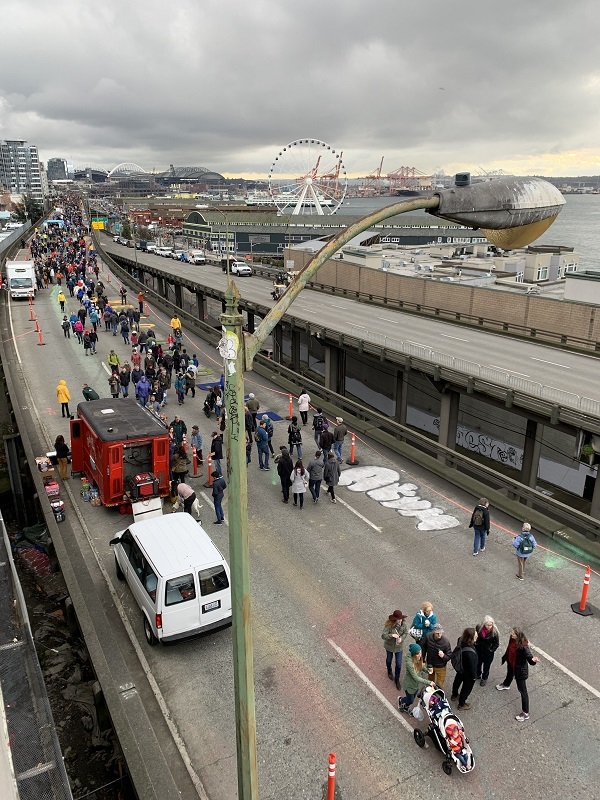 At the top right is the 1970s 40-story Rainier Tower, holding its own on its 12-story pedestal. Measurements show that that so far so good: everything on that side is solid. 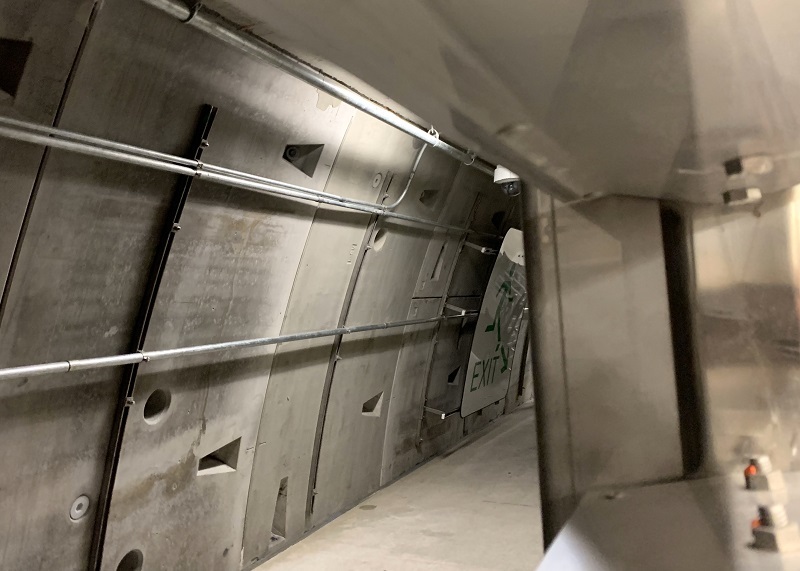 I took this picture on Tuesday, showing another U-shaped, hollow section of two sets of connected steel plates, being put into place. 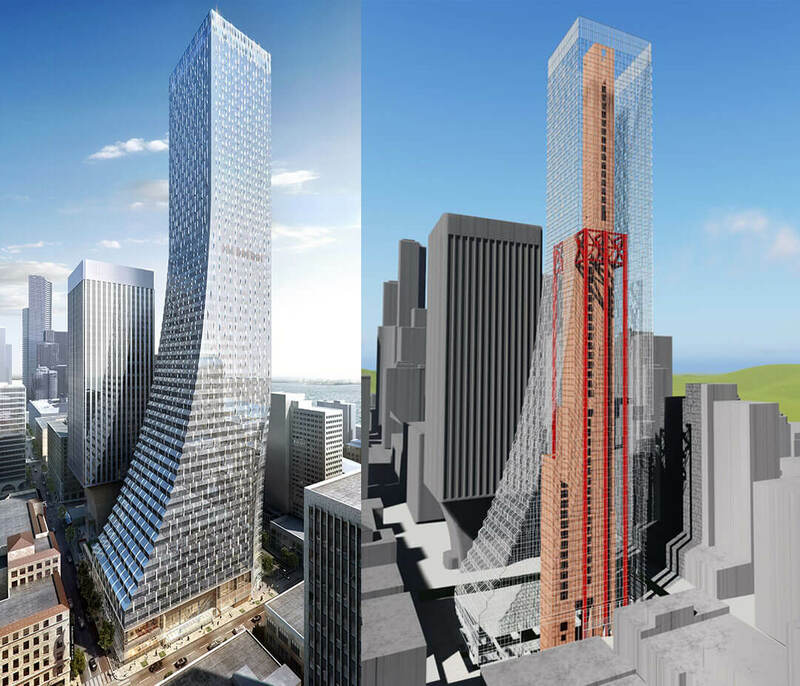 The new Rainier Square Tower (59 floors) will be right next to the existing Rainier Tower (40 floors). 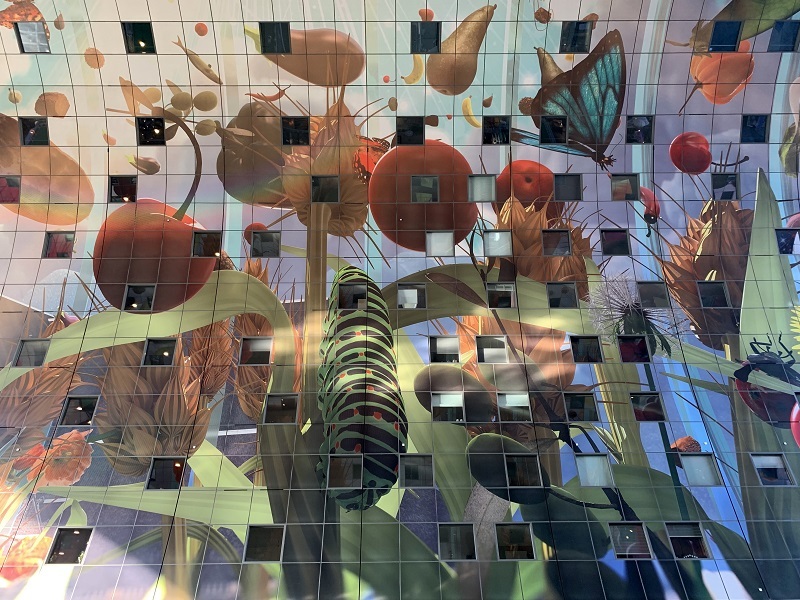 Left: A rendering of the completed Rainier Square Tower, designed by NBBJ – an American architecture, planning and design firm that was founded in Seattle in 1943, and today has offices around the world. 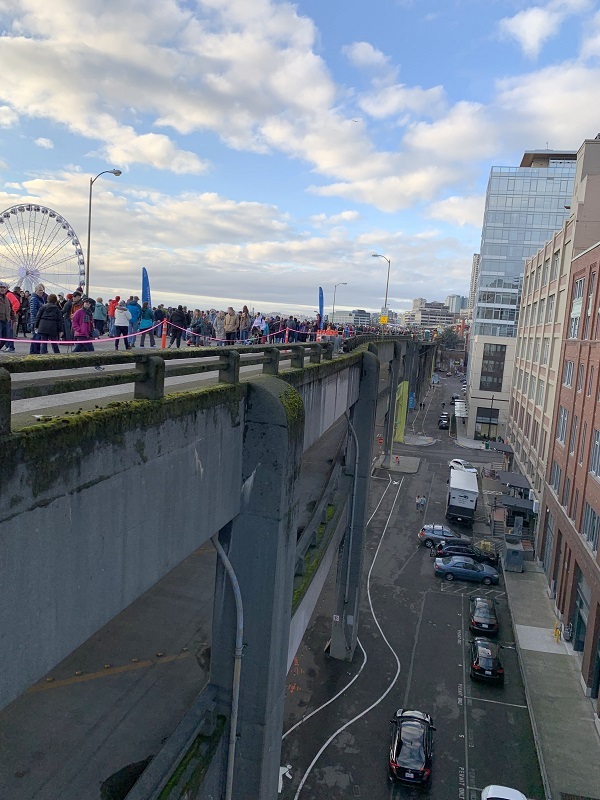 The curve towards its top allows it to be built next to architect Minoru Yamasaki’s 1970’s Rainier Tower, without completely obscuring it. Right: The filled steel plate core will go up all the way to the top, making for a very resilient structure. [Rainier Square Tower rendering courtesy of Wright Runstad & Company; conceptual graphic of steel core courtesy of Magnusson Klemencic Associates]. 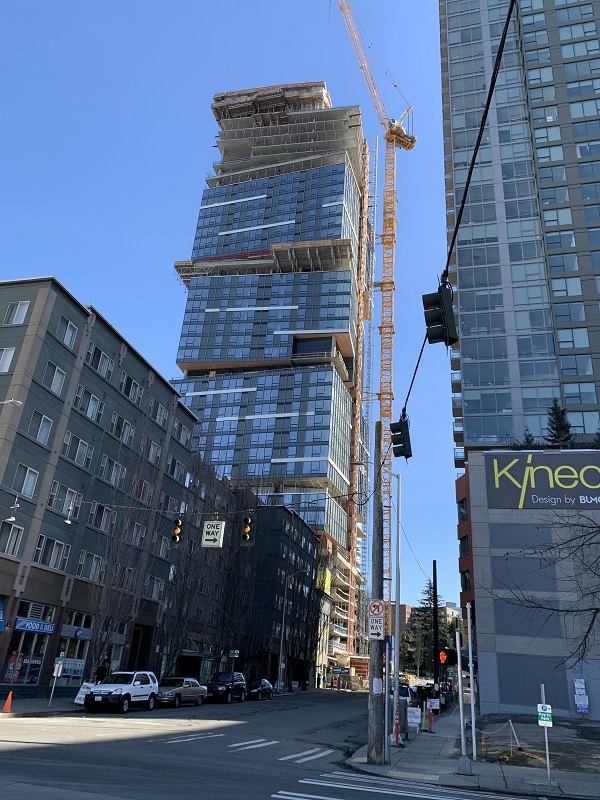 I went down Denny Way to go check on the construction of a condominium tower called the Nexus today, just north and east of downtown. 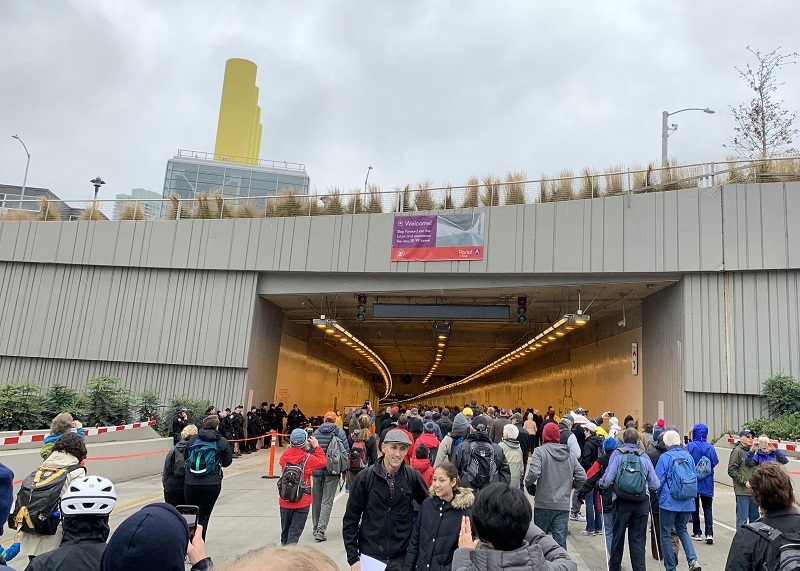 The construction boom is still going full-steam with dozens of downtown and South Lake Union projects only now getting off the ground. This is the base of the Nexus condominium tower with two of the four stacked ‘cubes’ it will eventually have, that are each offset by 8° from the one below it. 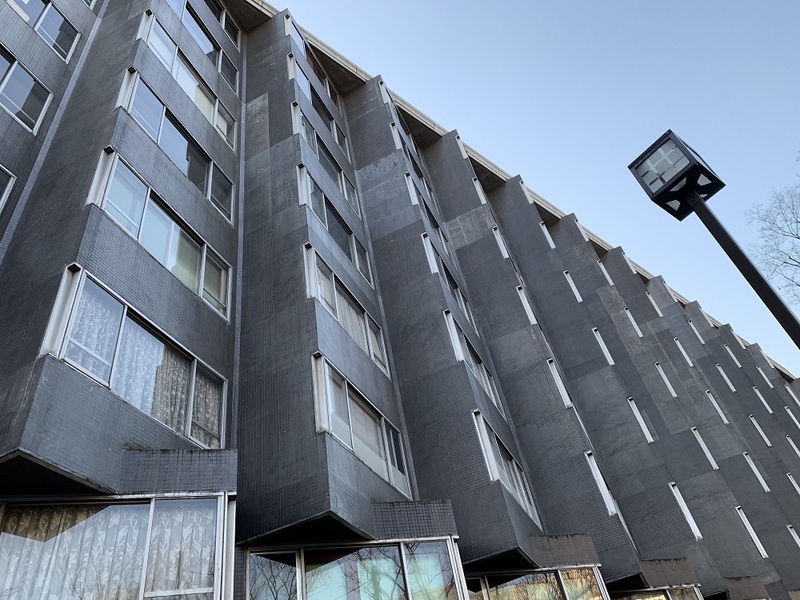 Some 29 of the 389 units in the 41-story building are still available, priced from $1.2 million to the high $2 millions. 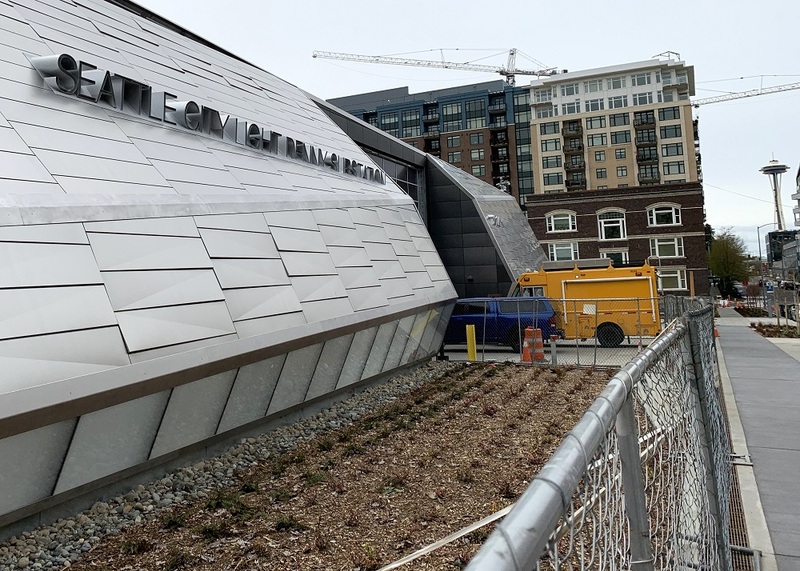 It’s all glass and steel one block away. This view from the corner of Stewart St and Boren Ave; corporate offices left and the AMLI Arc apartment tower on the right. 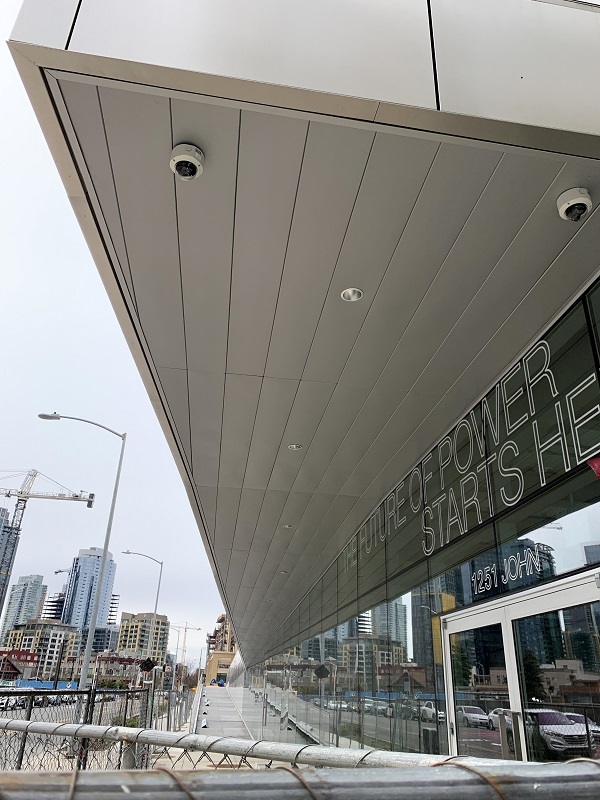 And one more block down, the $400 million Hyatt Regency (the Pacific Northwest’s largest hotel with 1,260 rooms) is about to open its doors to guests.